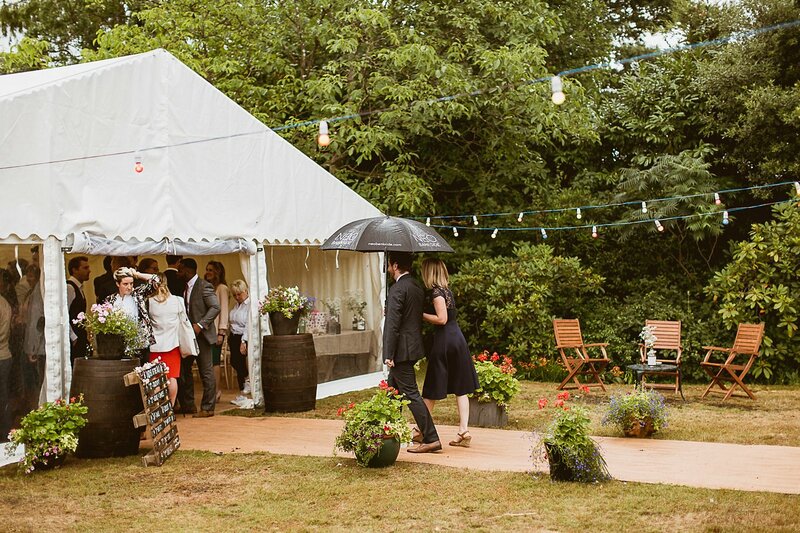 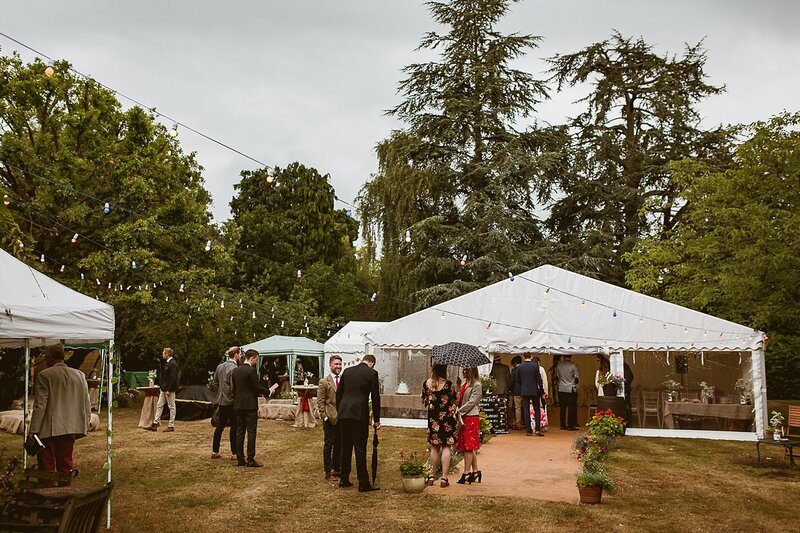 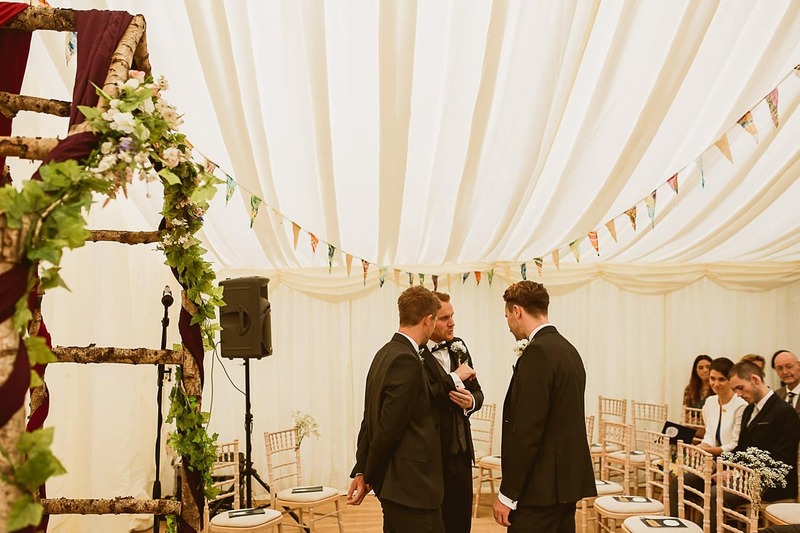 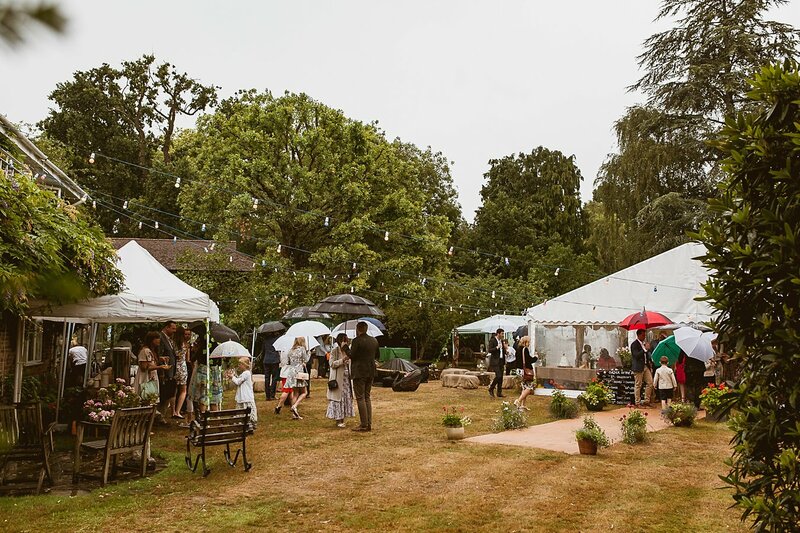 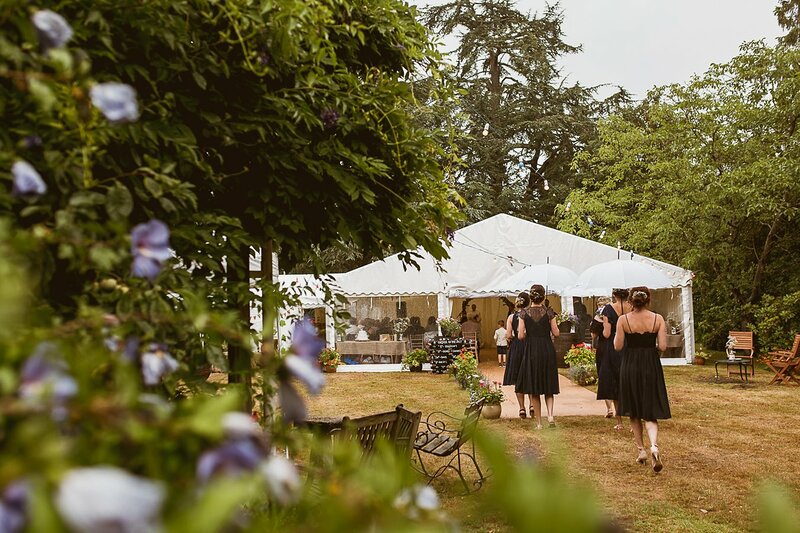 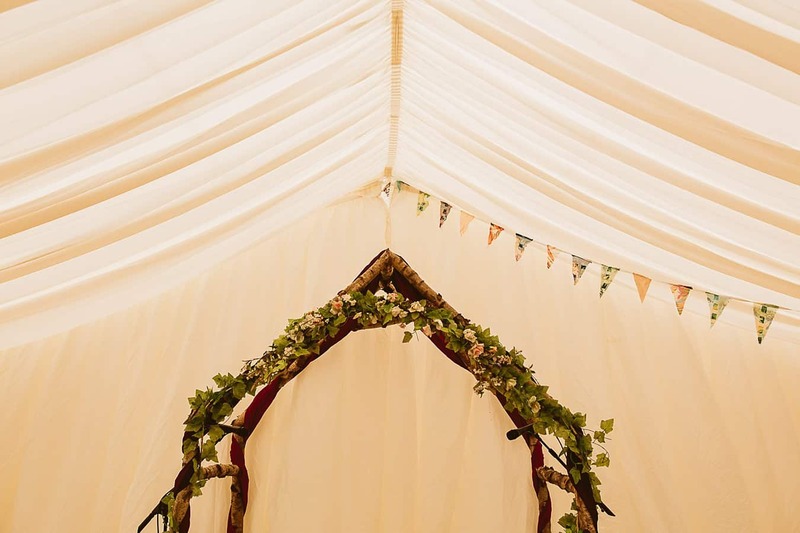 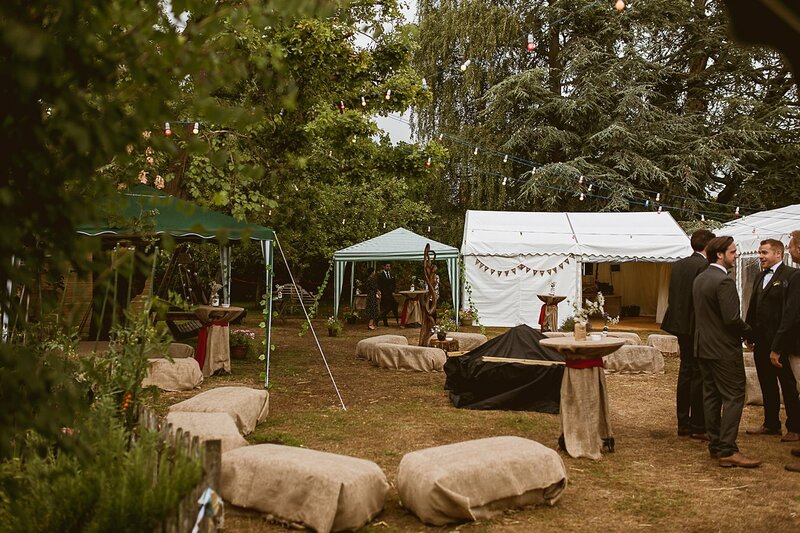 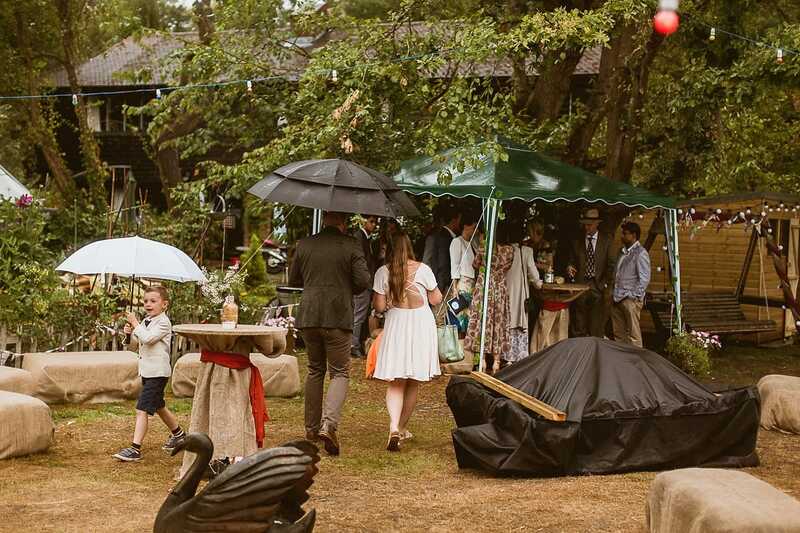 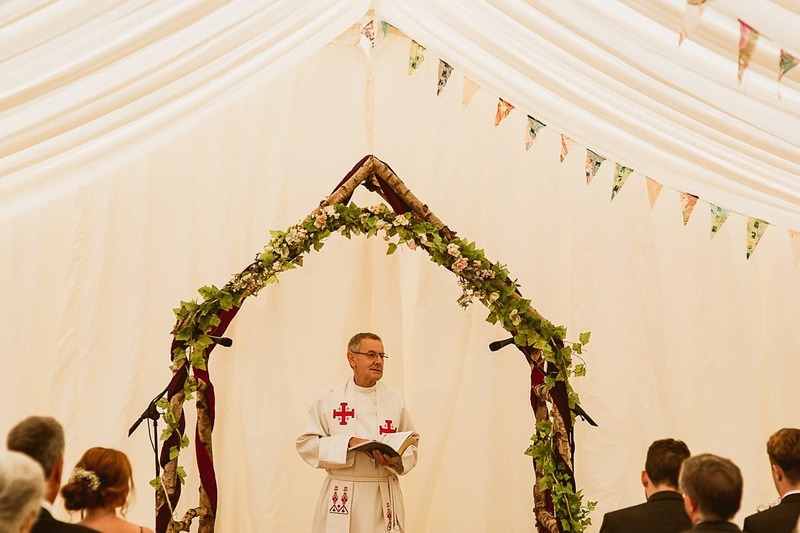 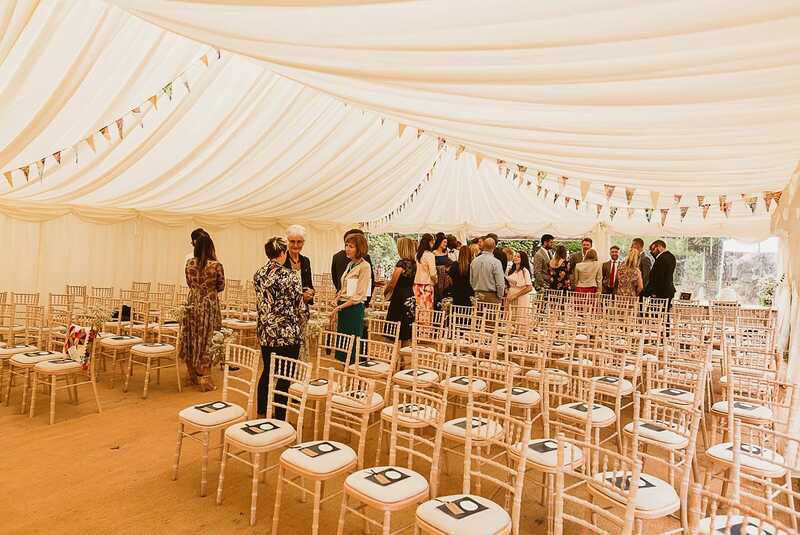 This garden wedding in Surrey was set to be a beautiful summers’ day in late July, with the whole day themed as an summer garden party. 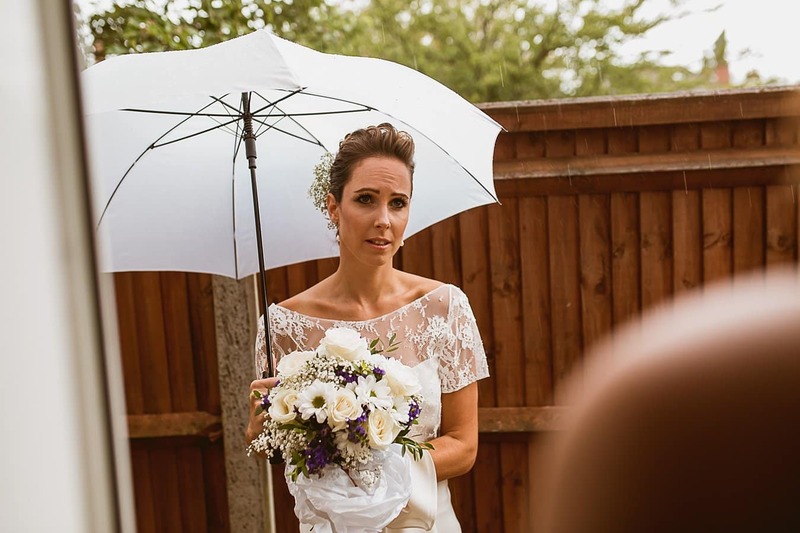 Unfortunately the English weather had other ideas. 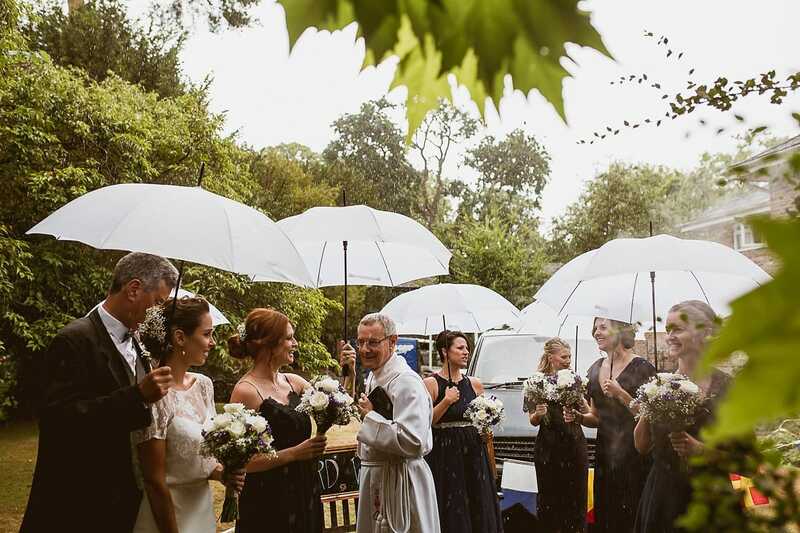 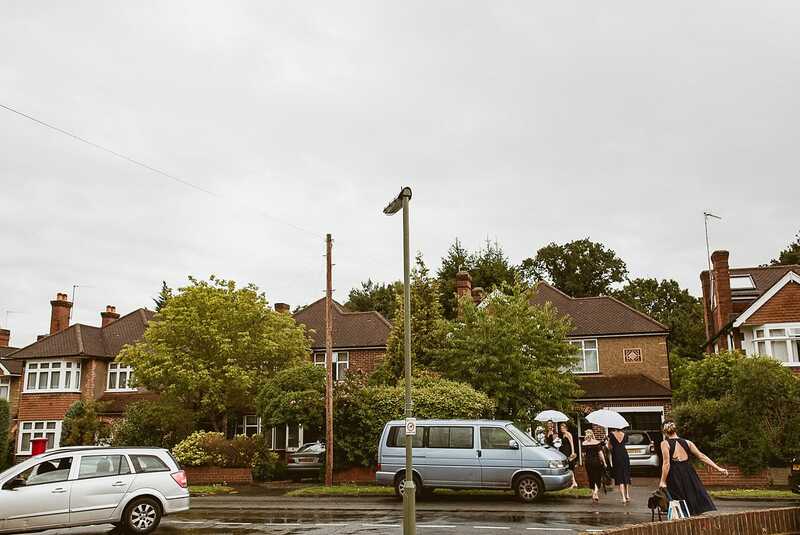 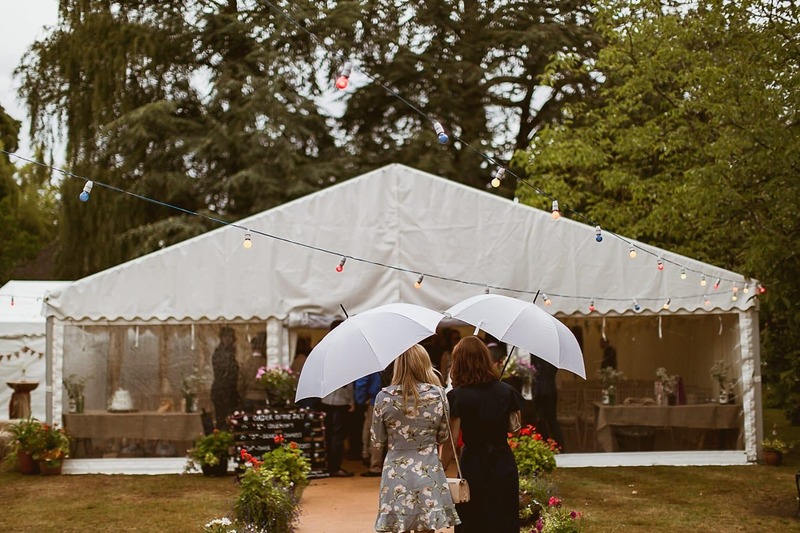 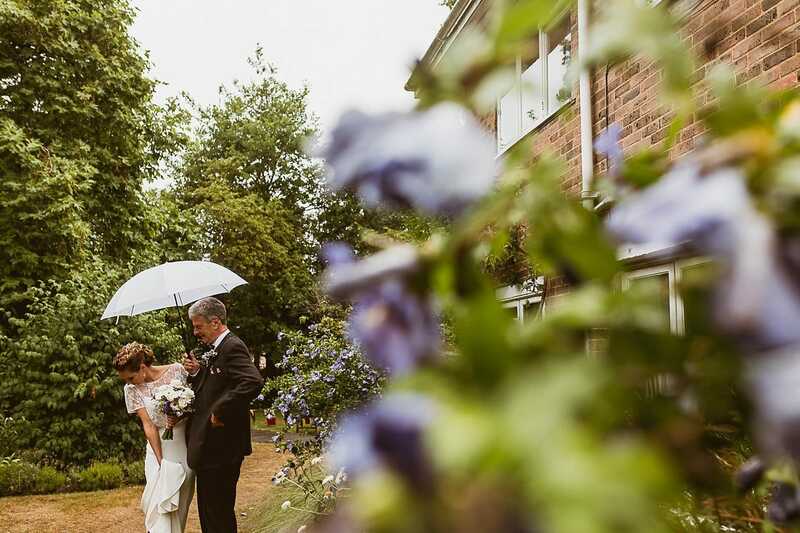 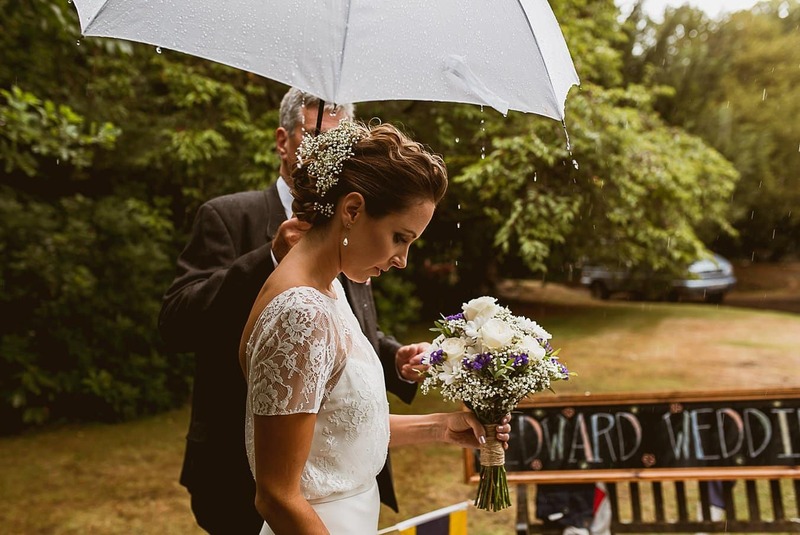 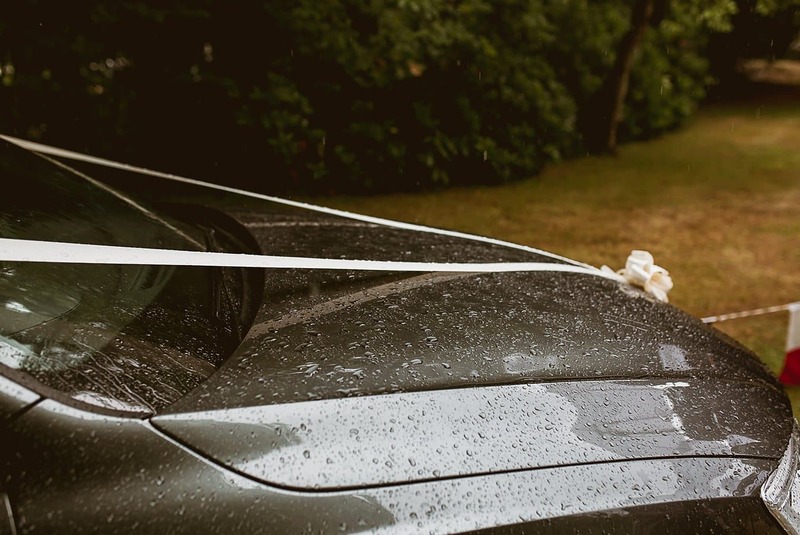 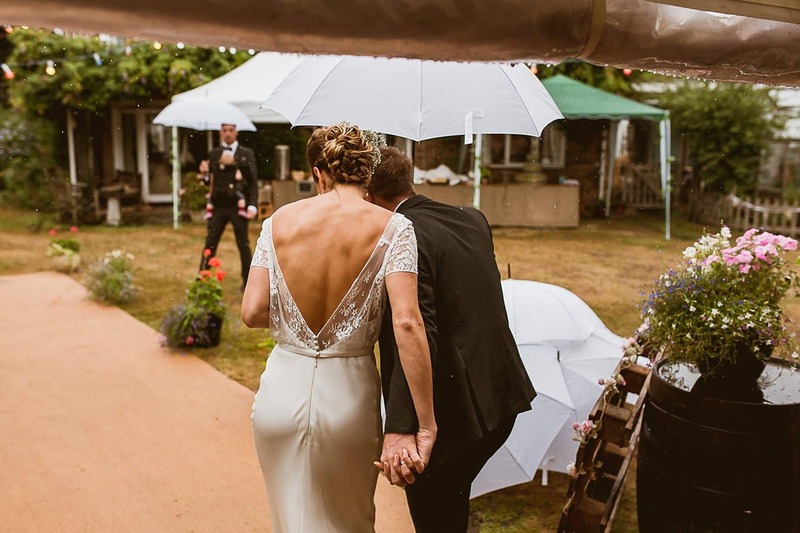 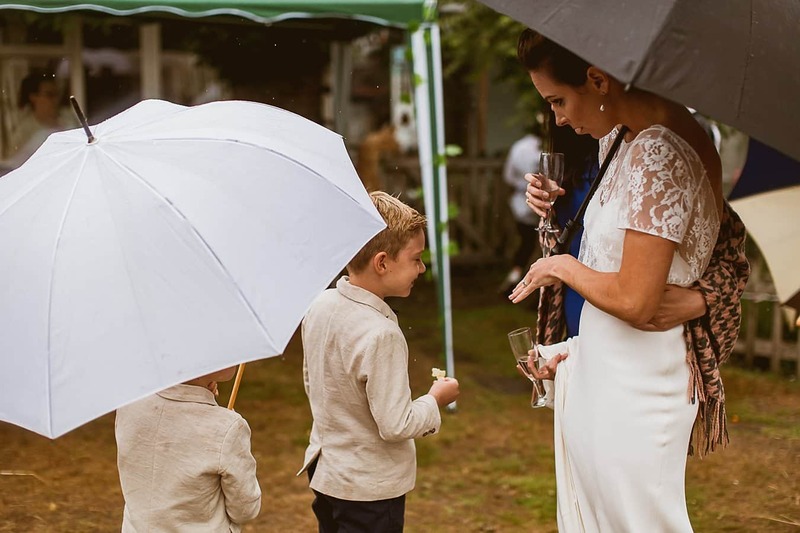 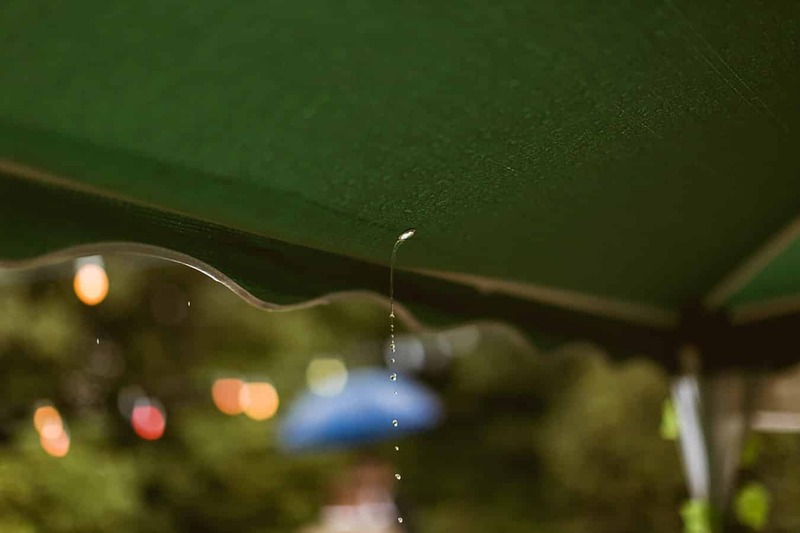 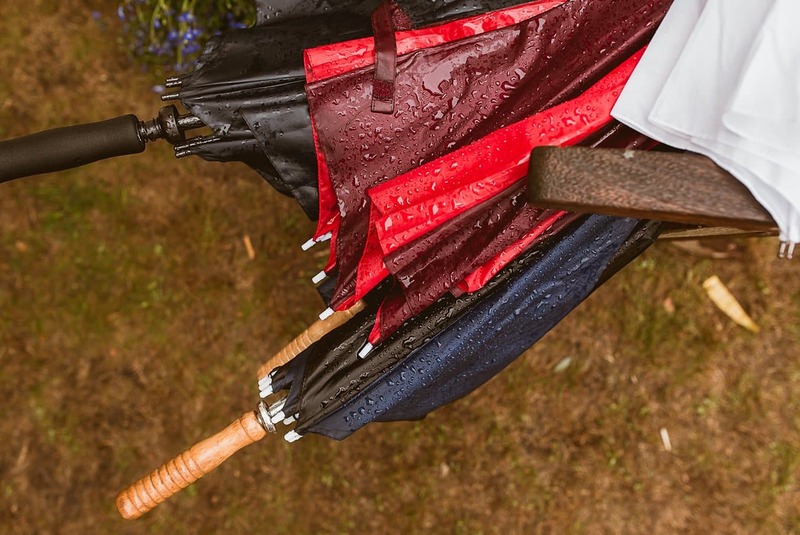 But, the rain couldn’t dampen Jenny + Ed’s spirits as they became Husband and Wife in front of all their family and friends, and Jenny had prepared in advance by sourcing as many umbrellas as possible! 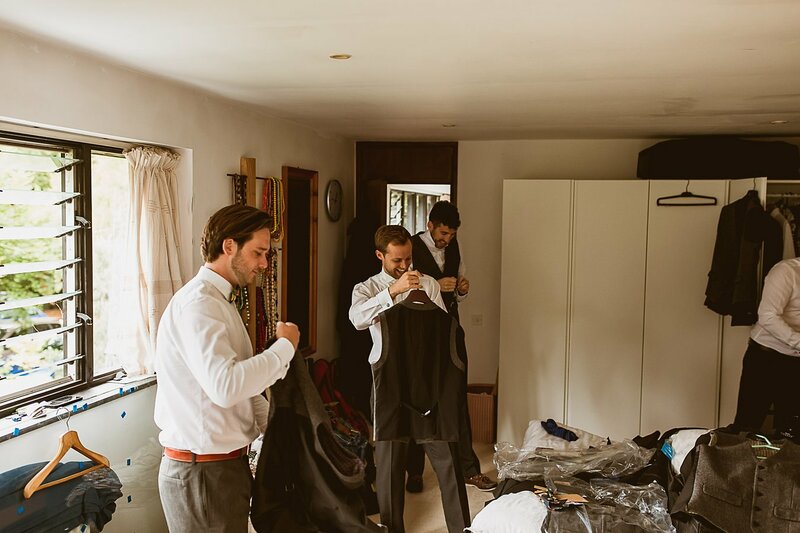 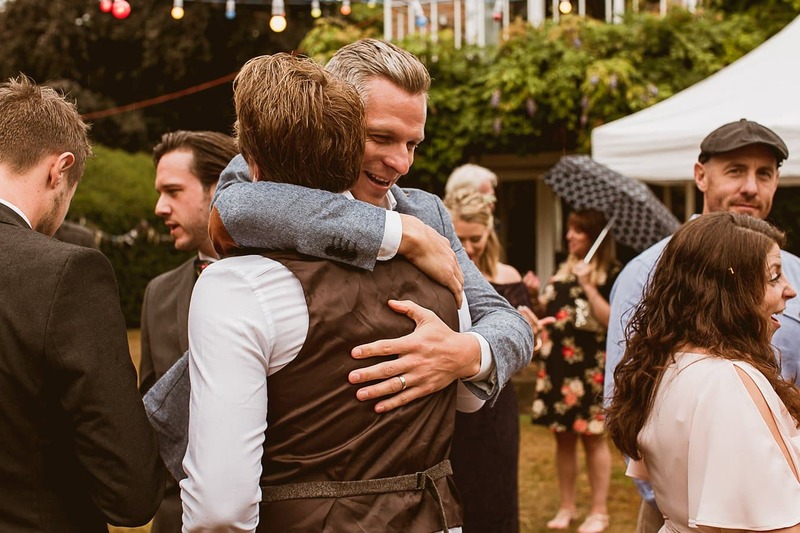 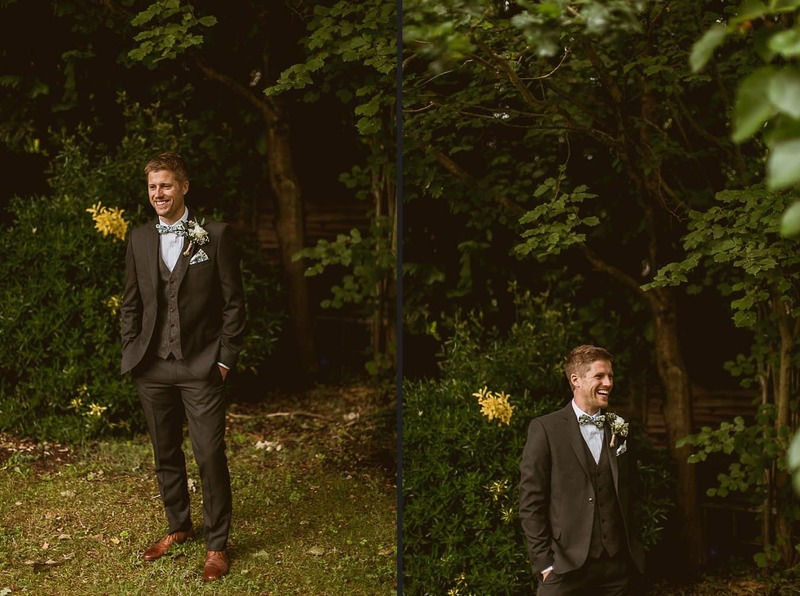 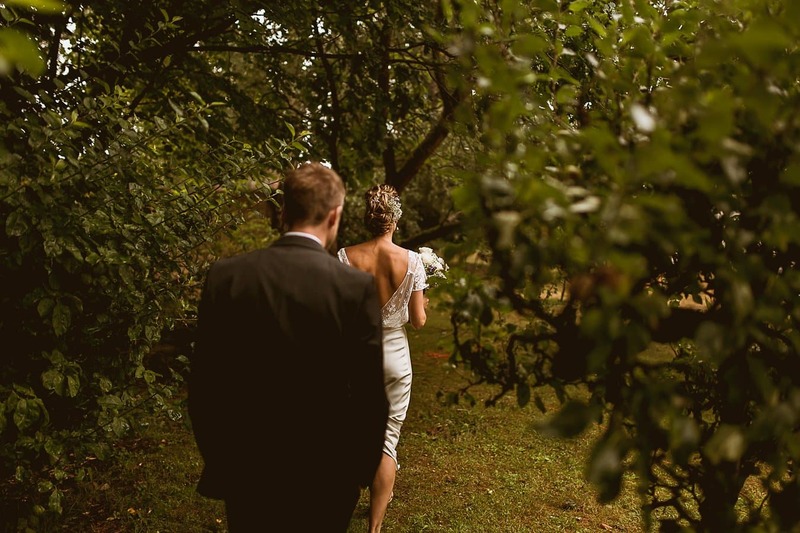 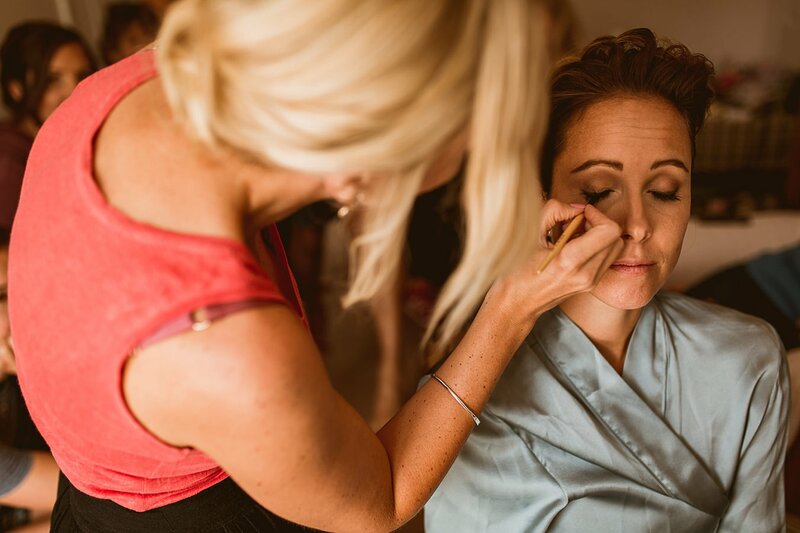 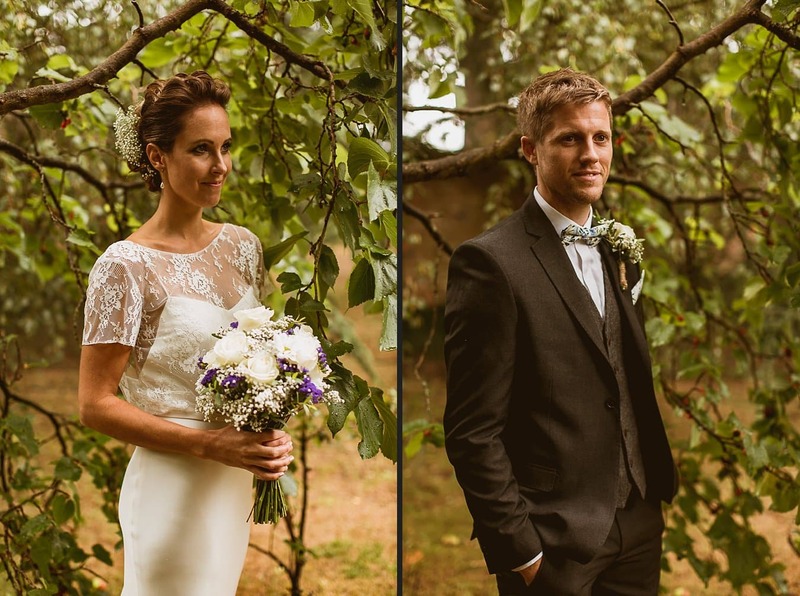 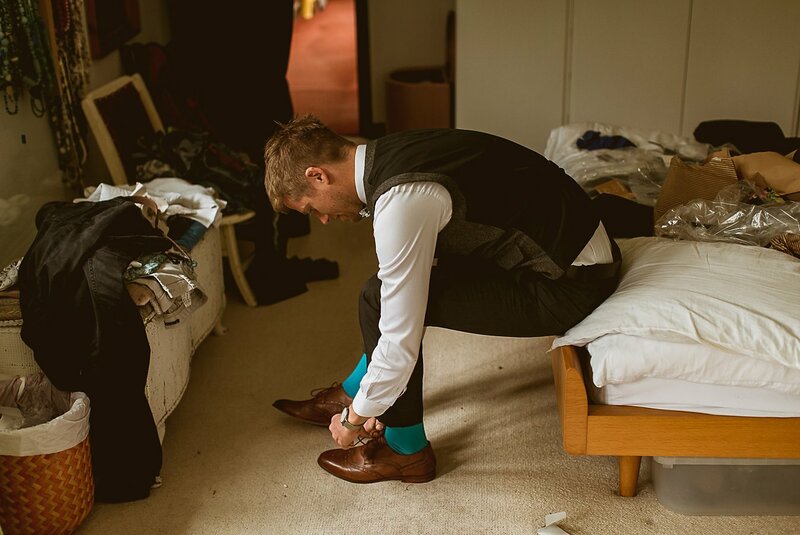 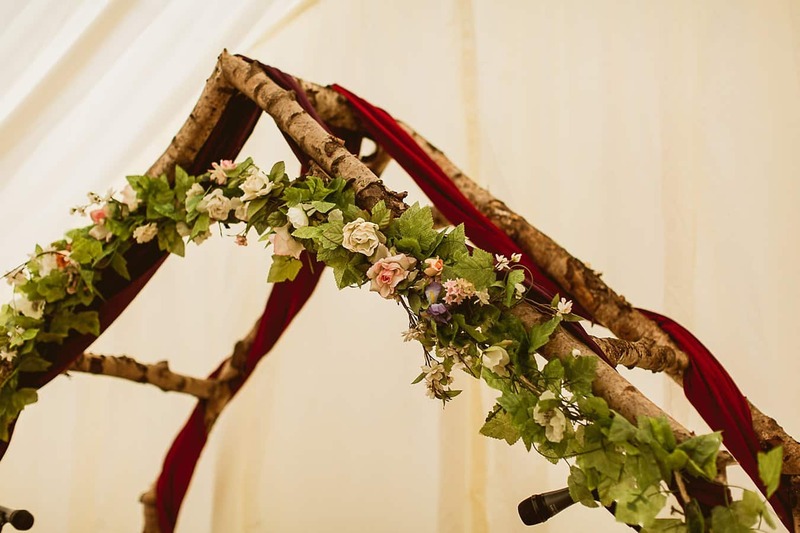 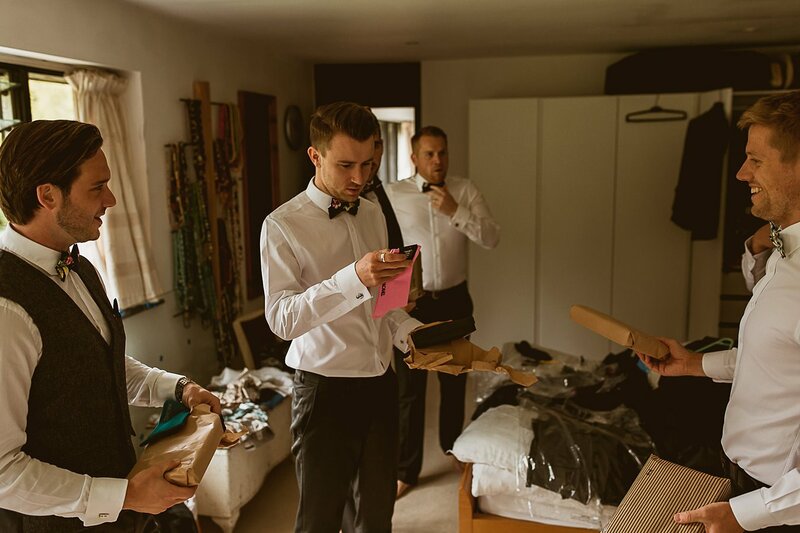 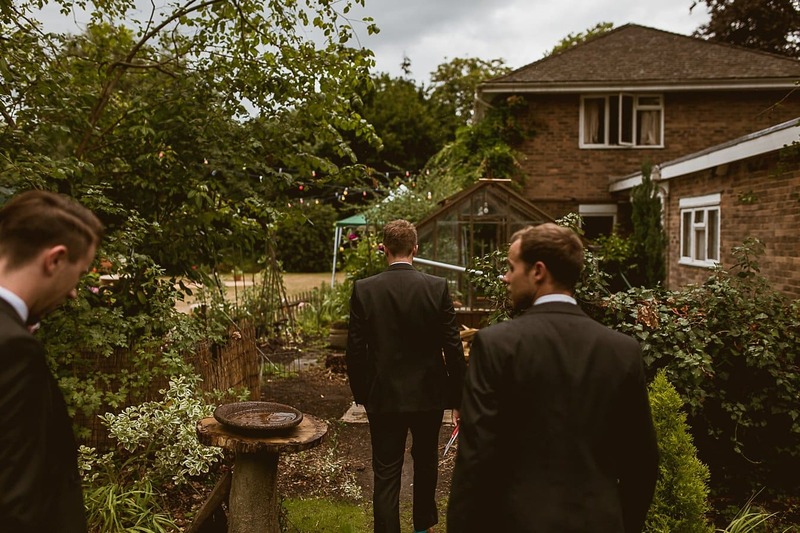 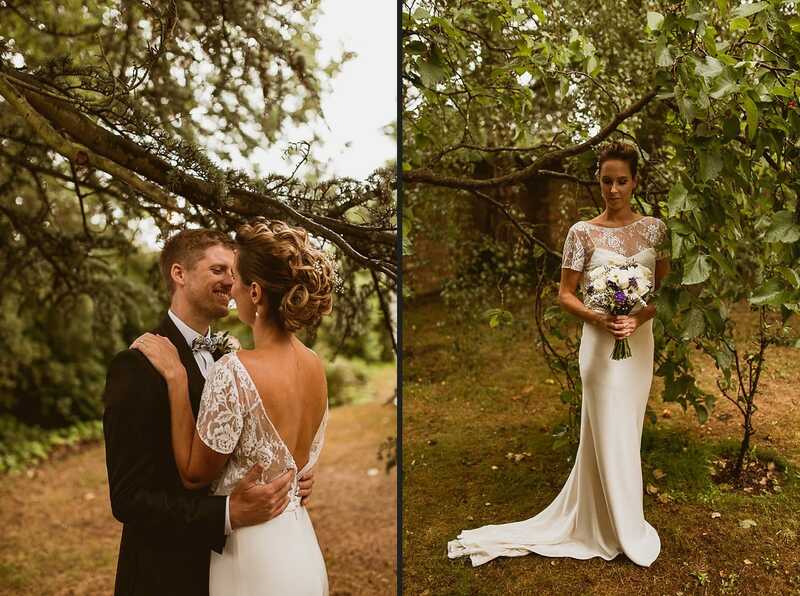 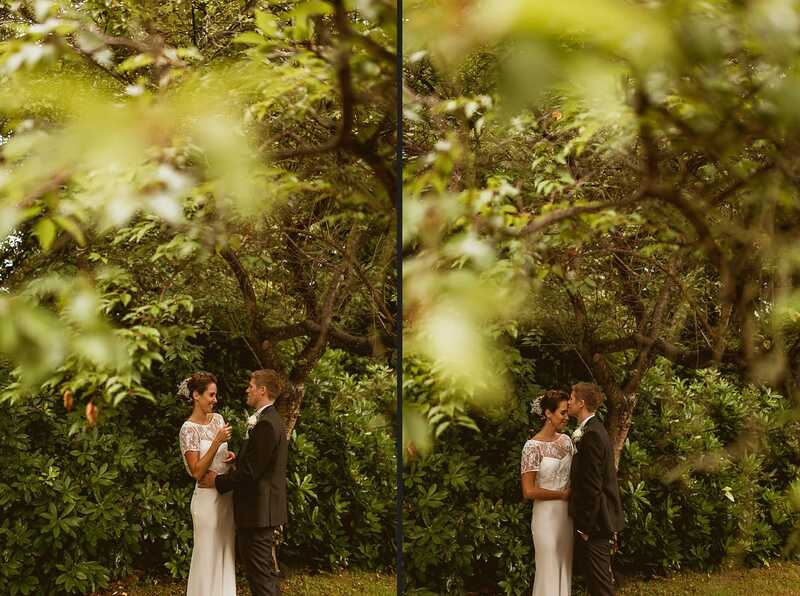 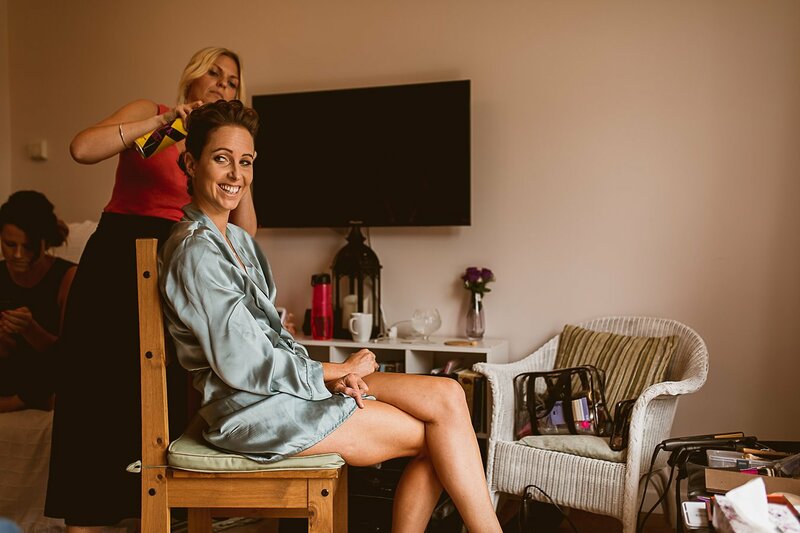 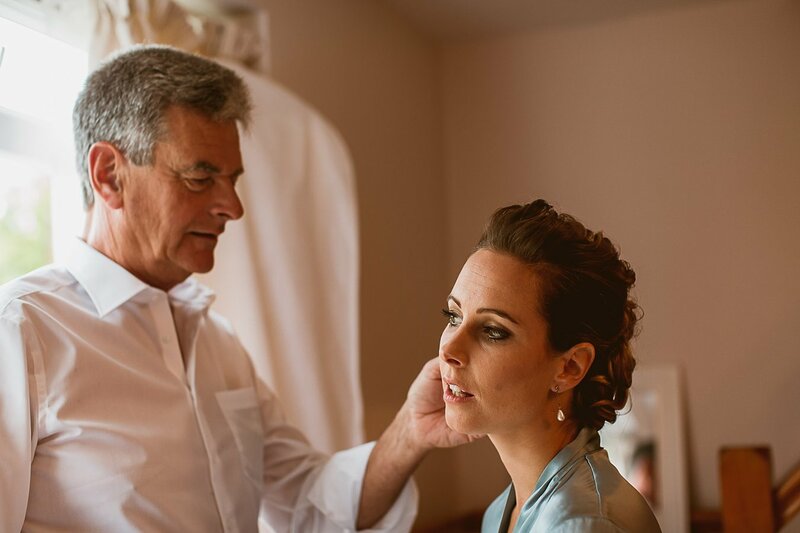 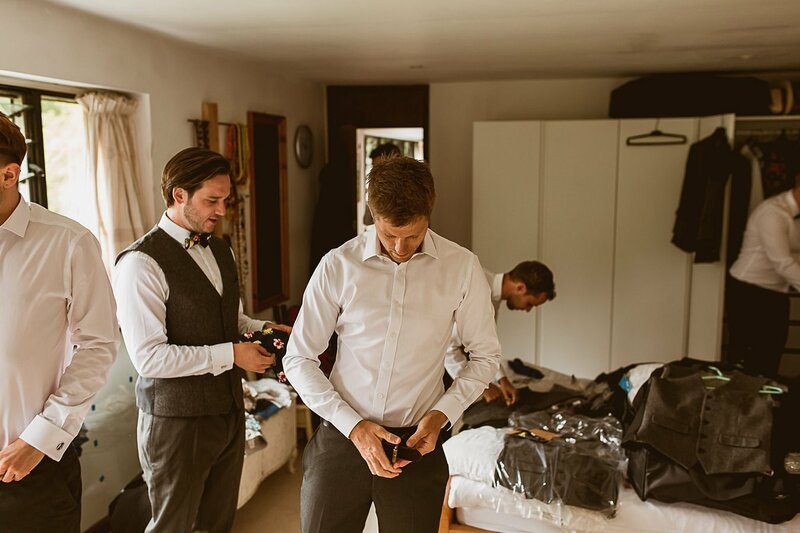 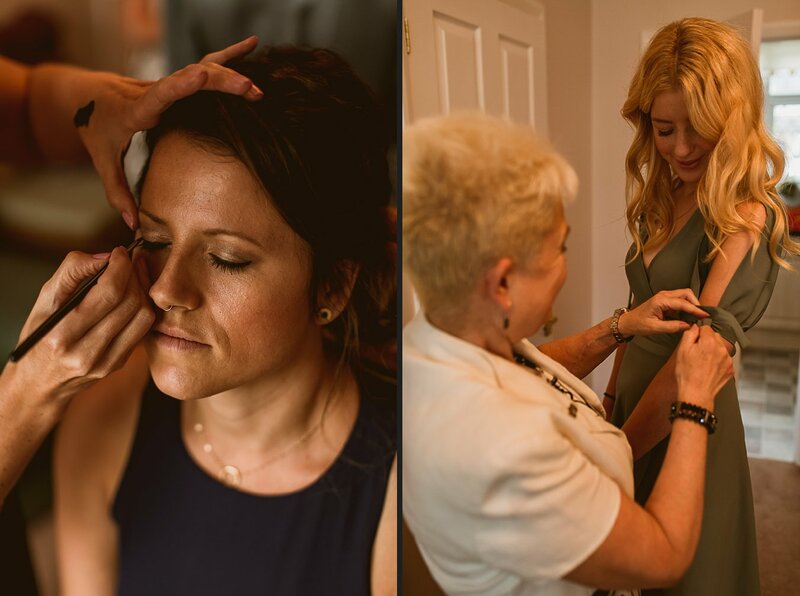 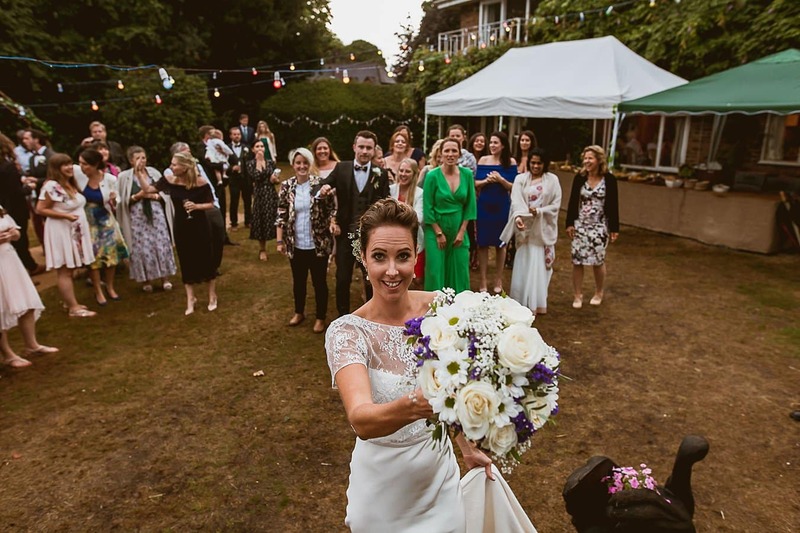 The best thing about choosing a garden wedding in leafy surrey was the free hand it gave Jenny + Ed to style their own day. 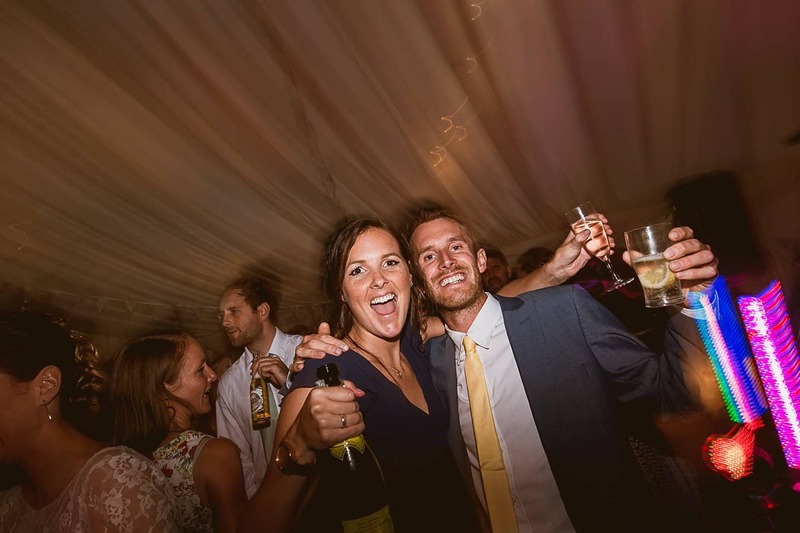 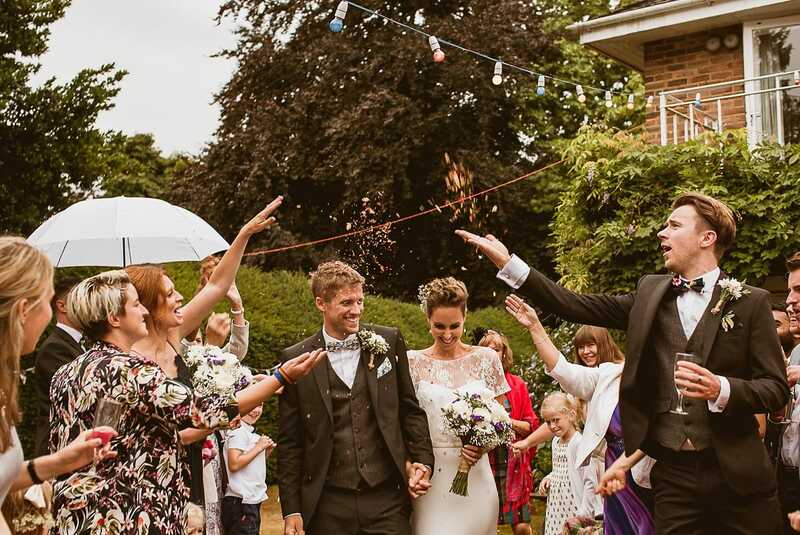 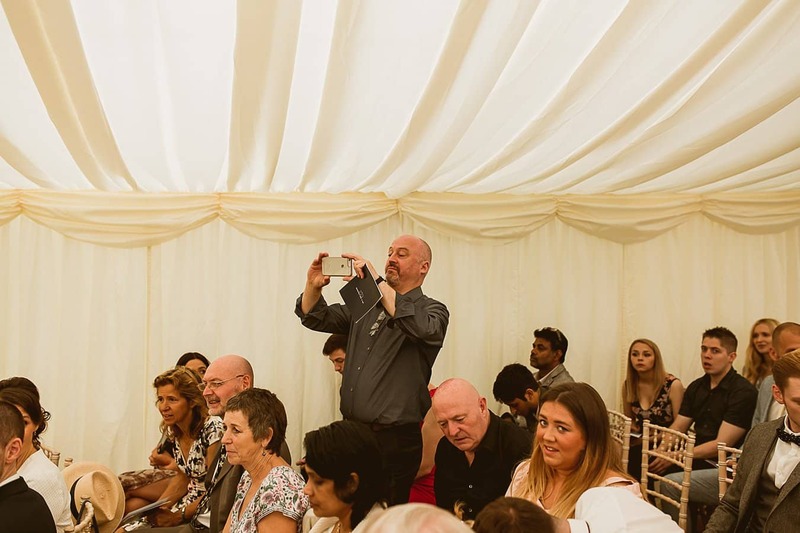 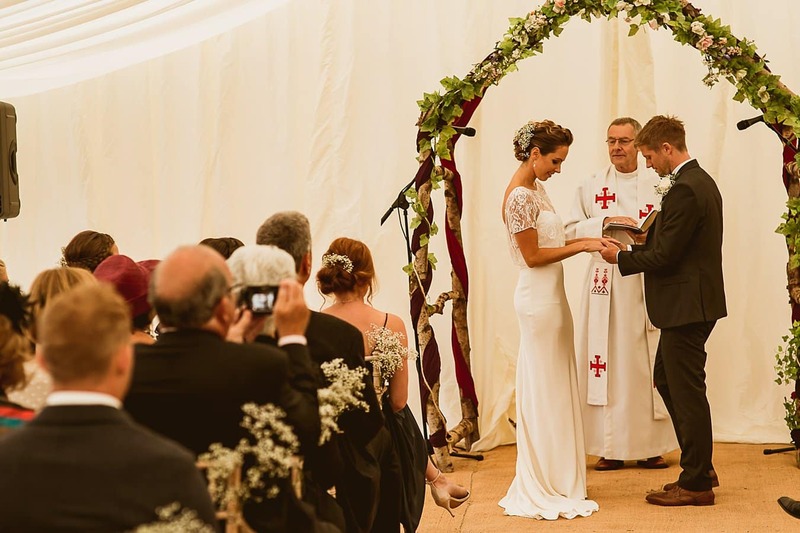 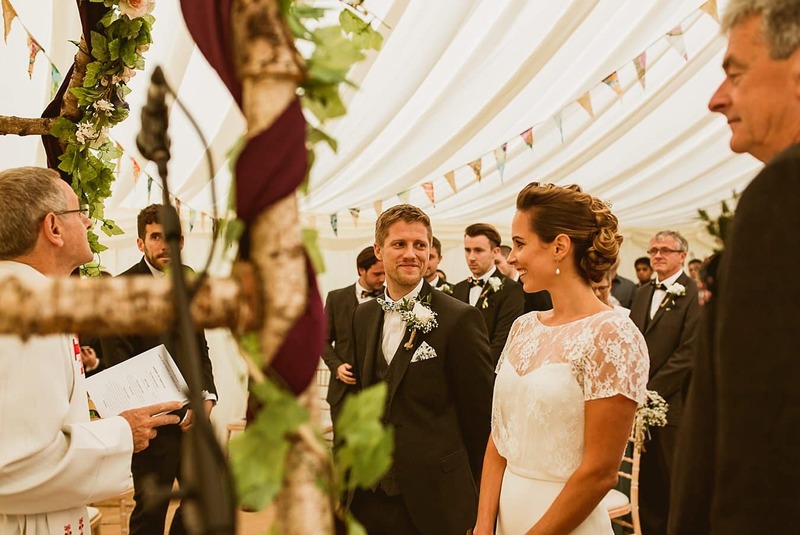 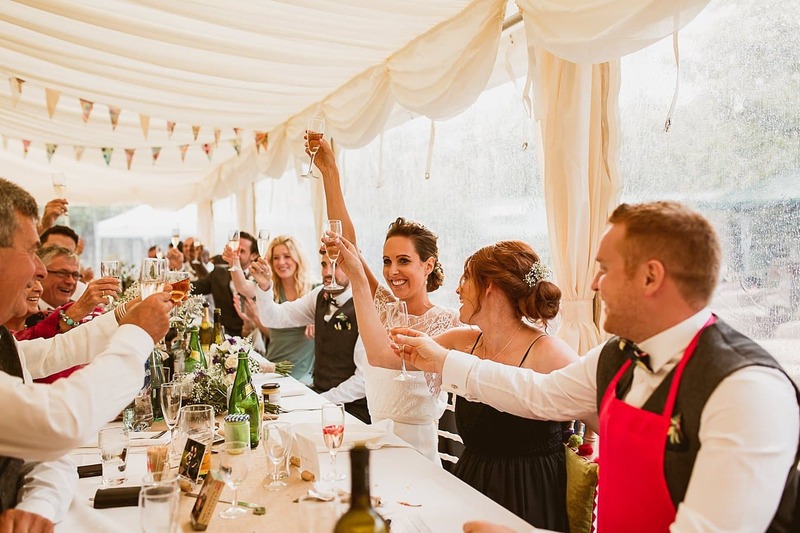 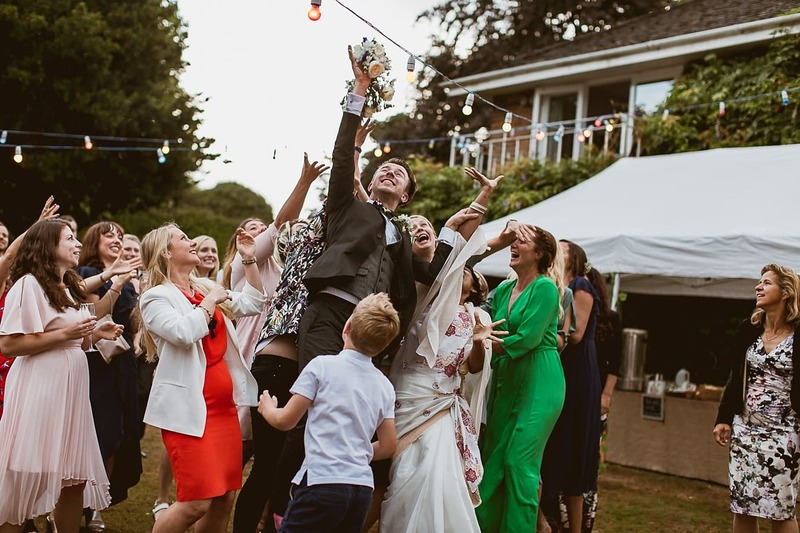 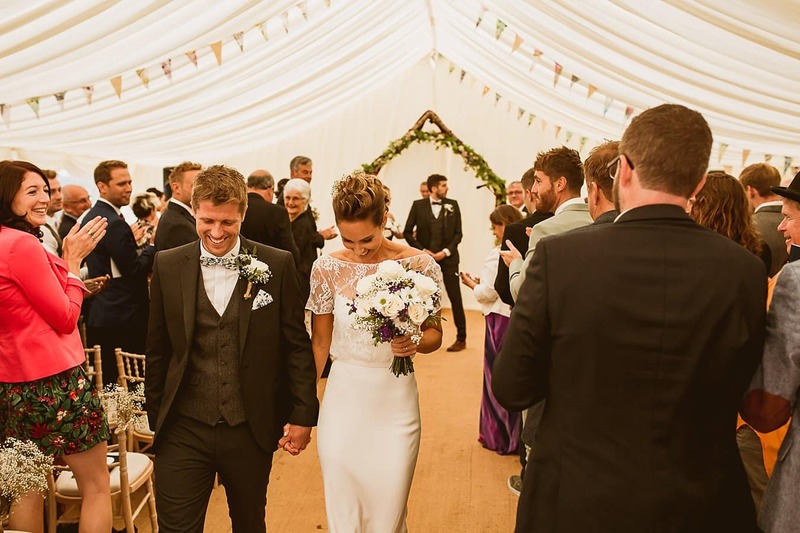 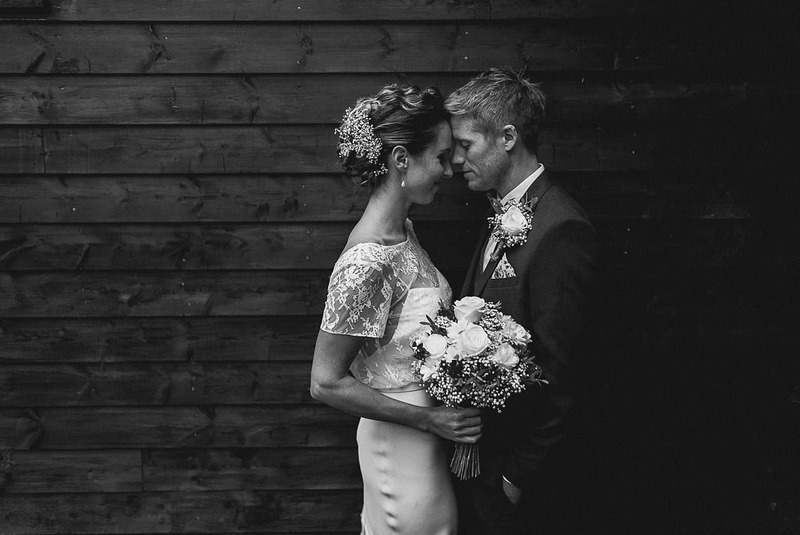 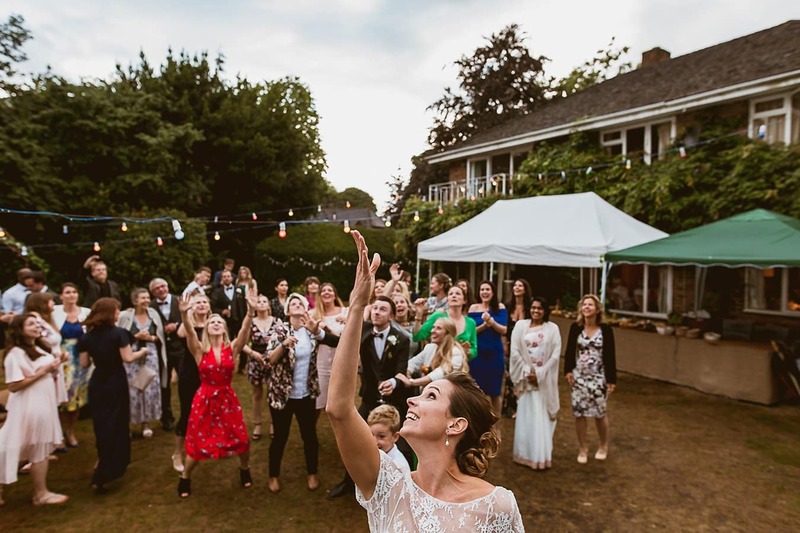 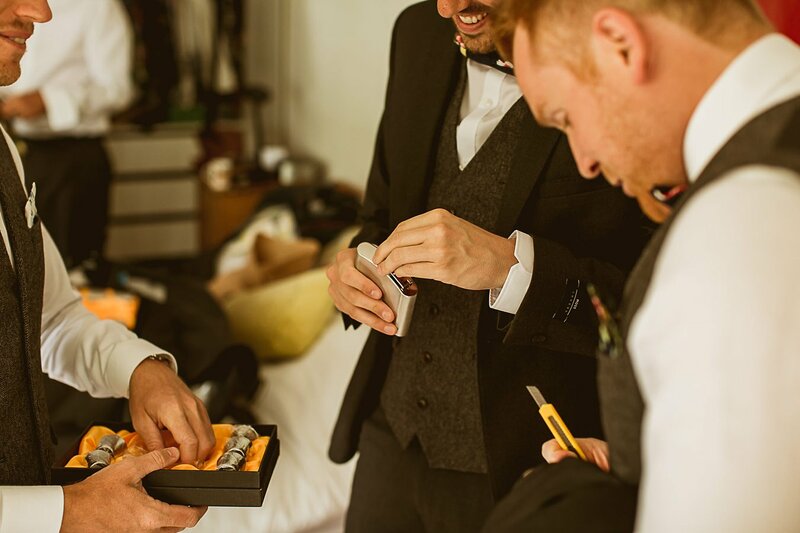 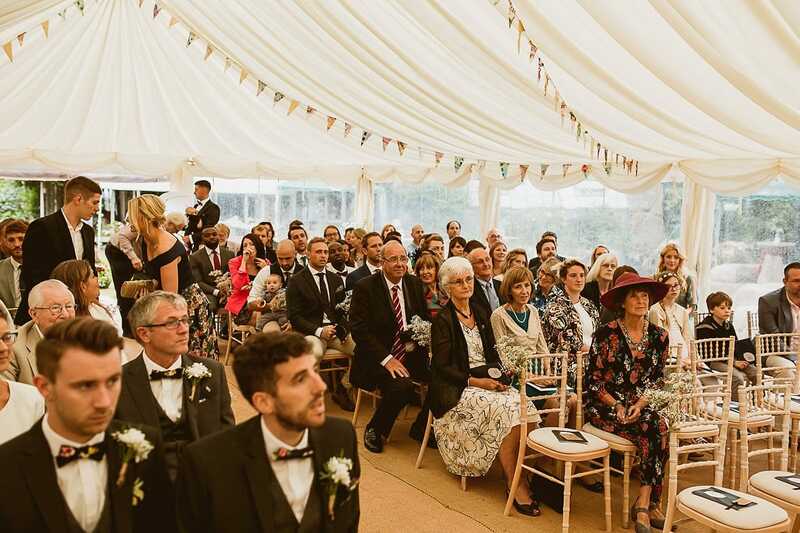 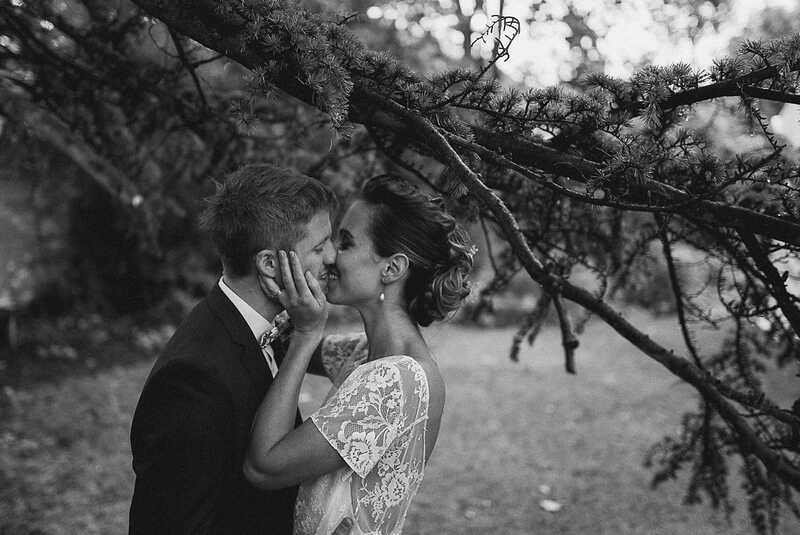 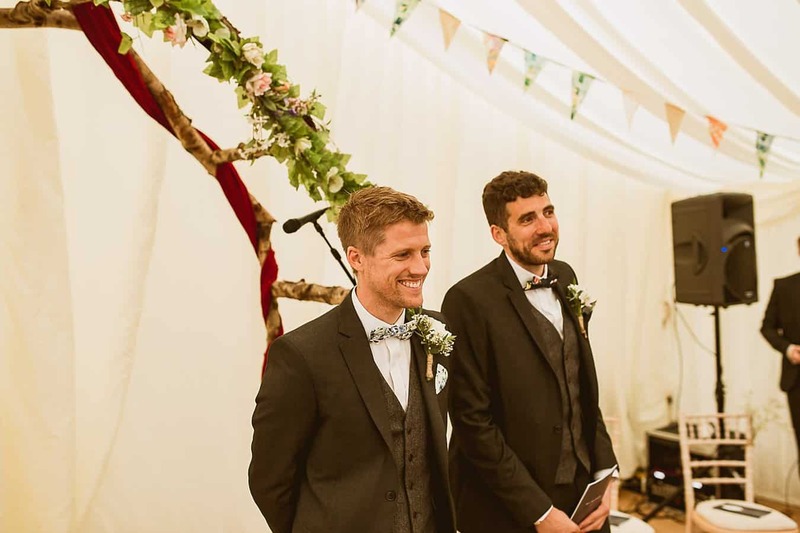 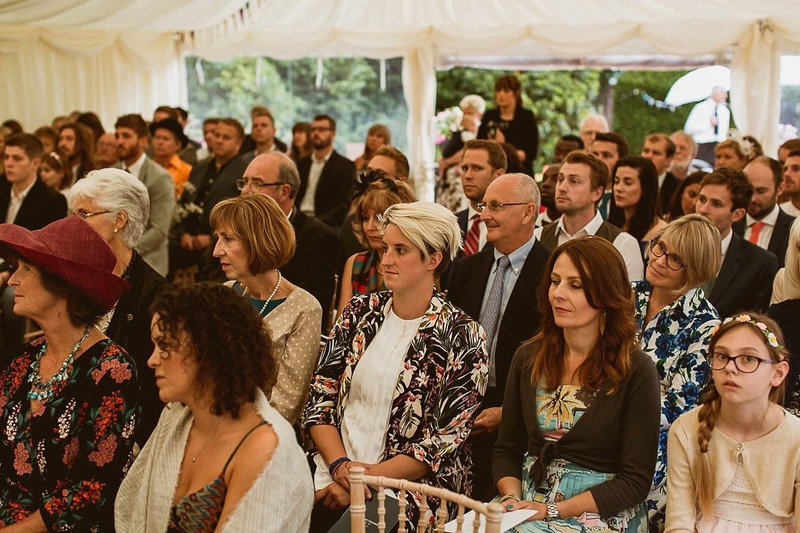 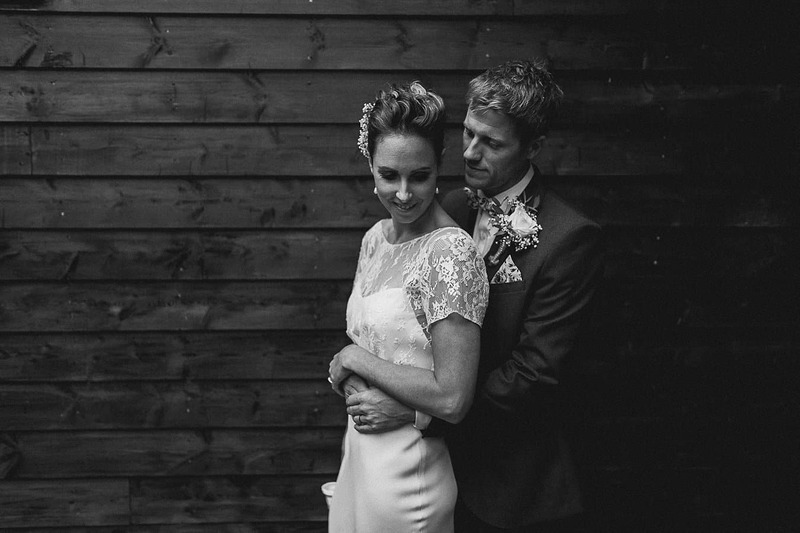 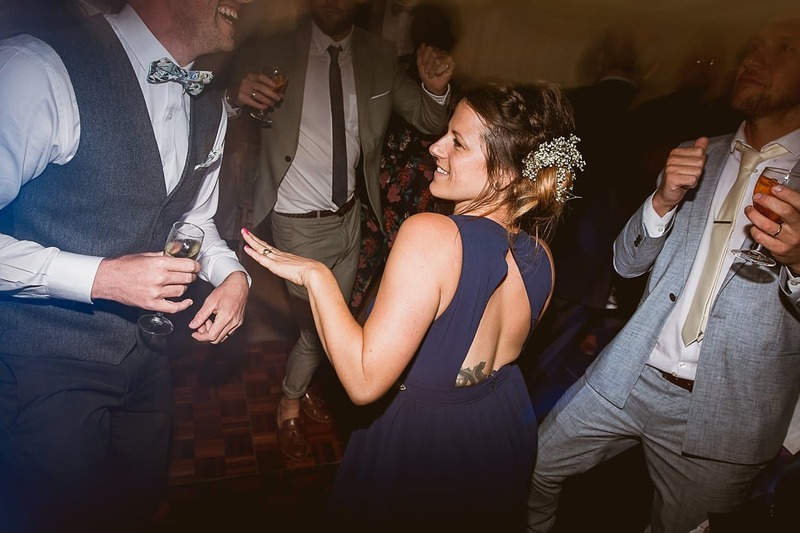 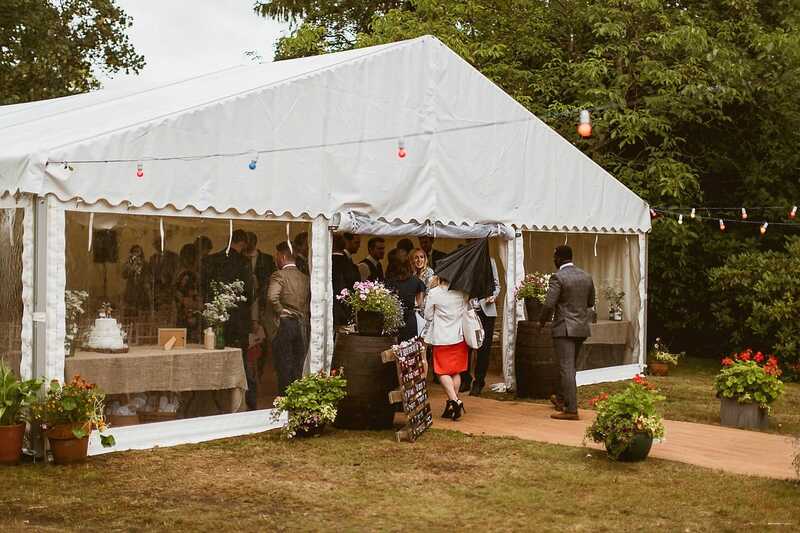 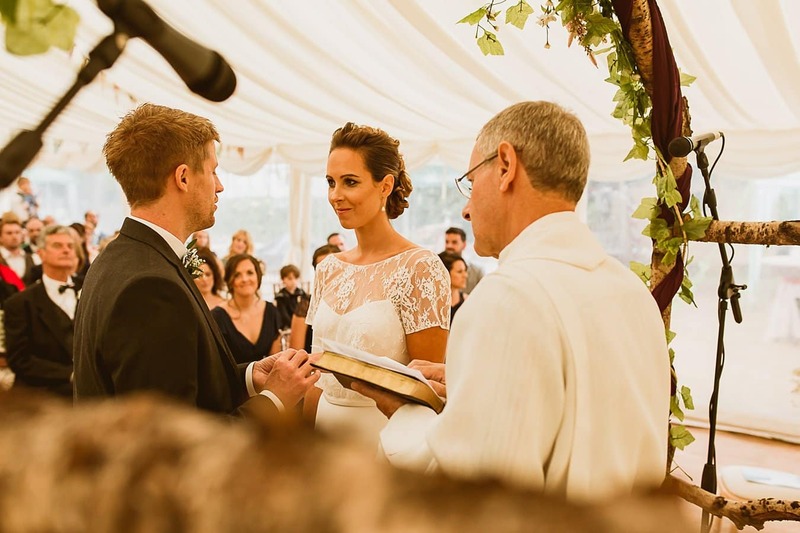 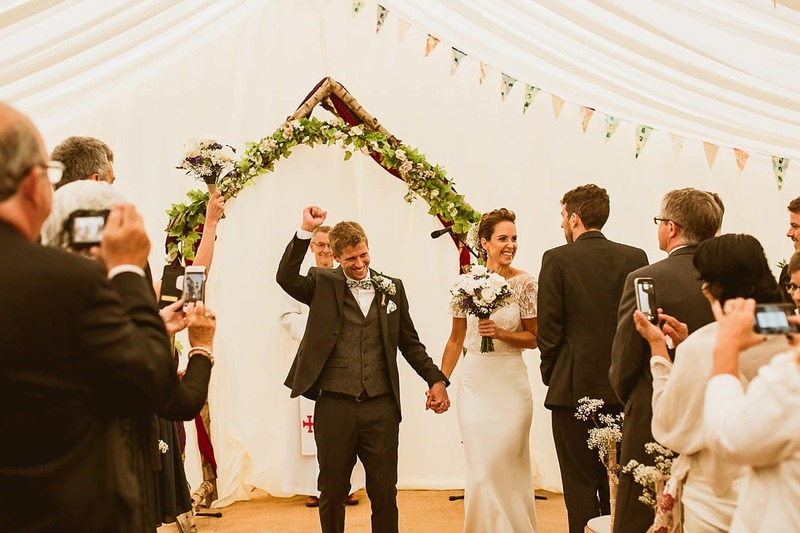 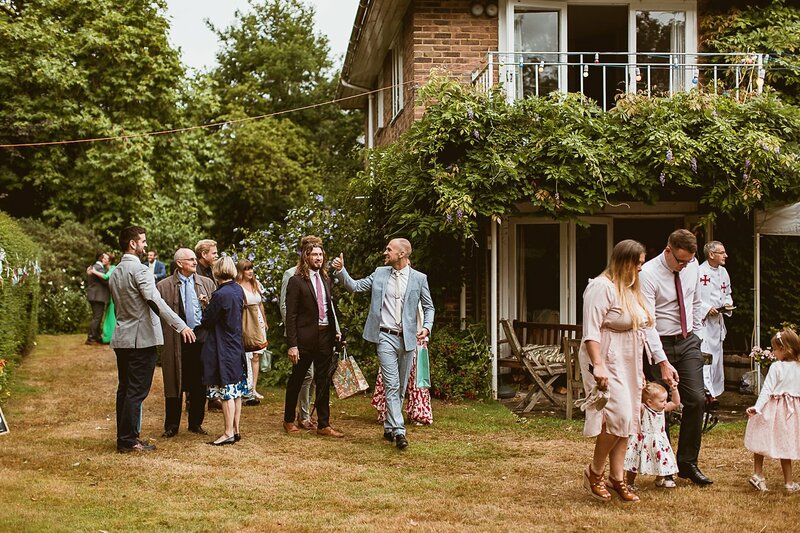 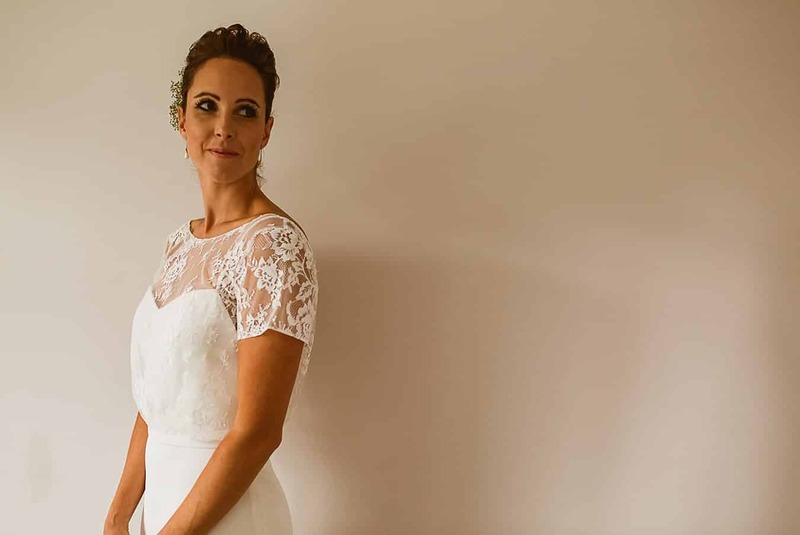 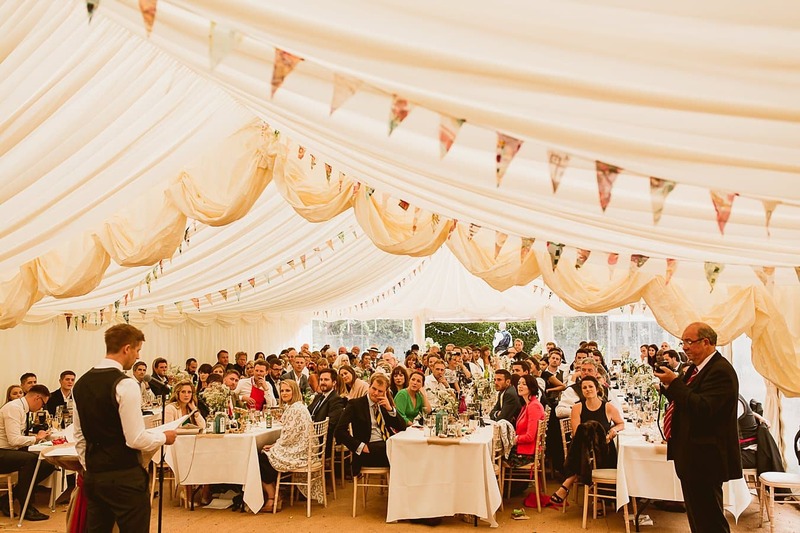 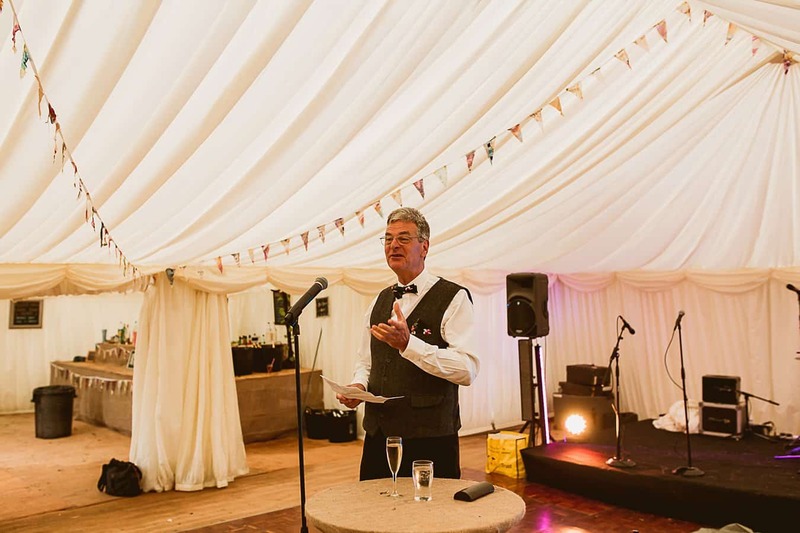 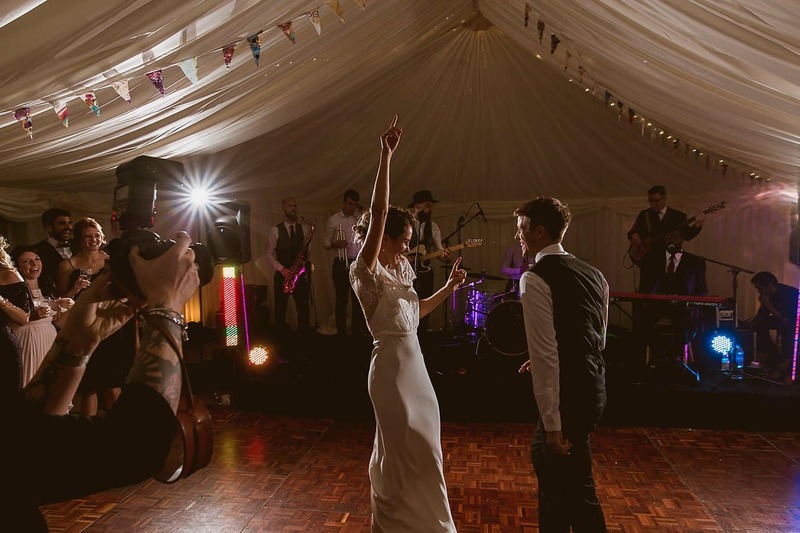 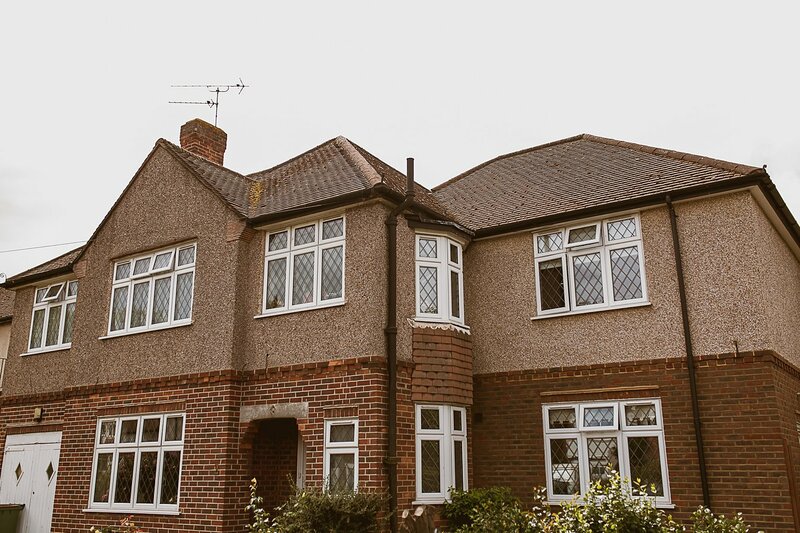 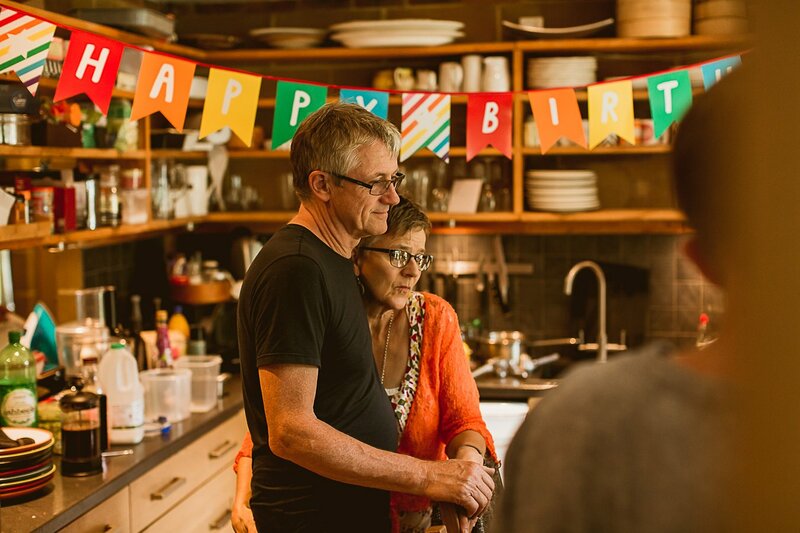 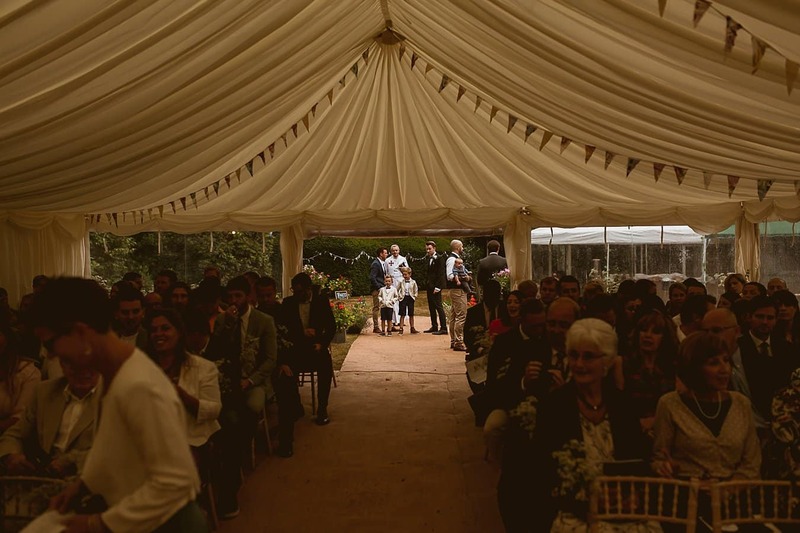 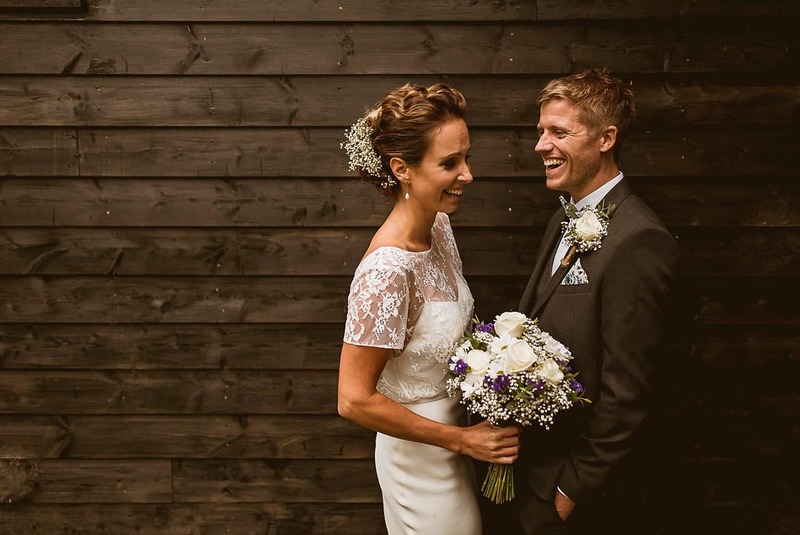 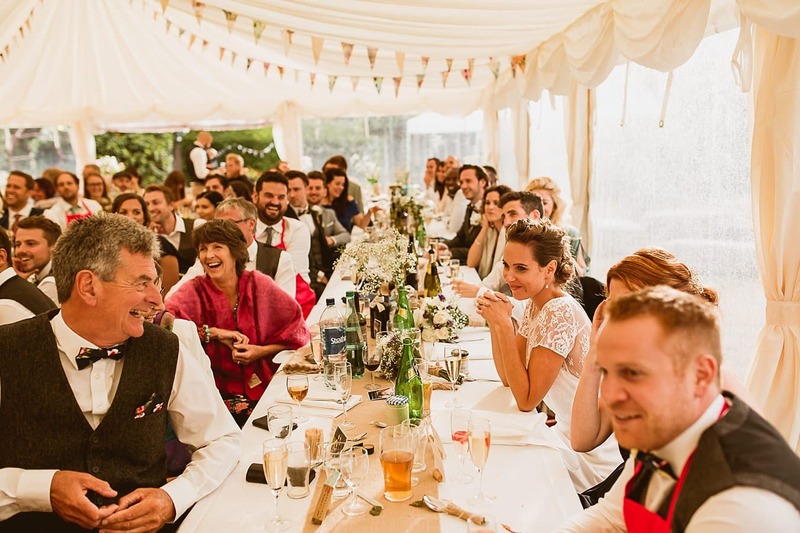 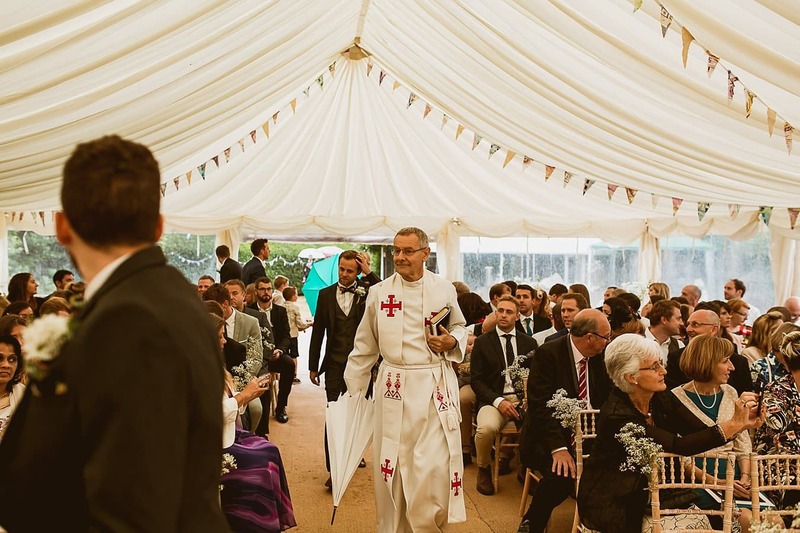 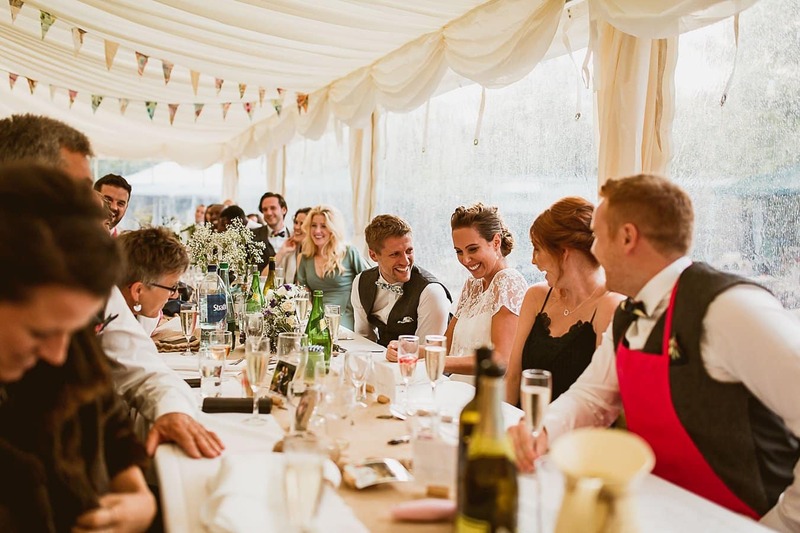 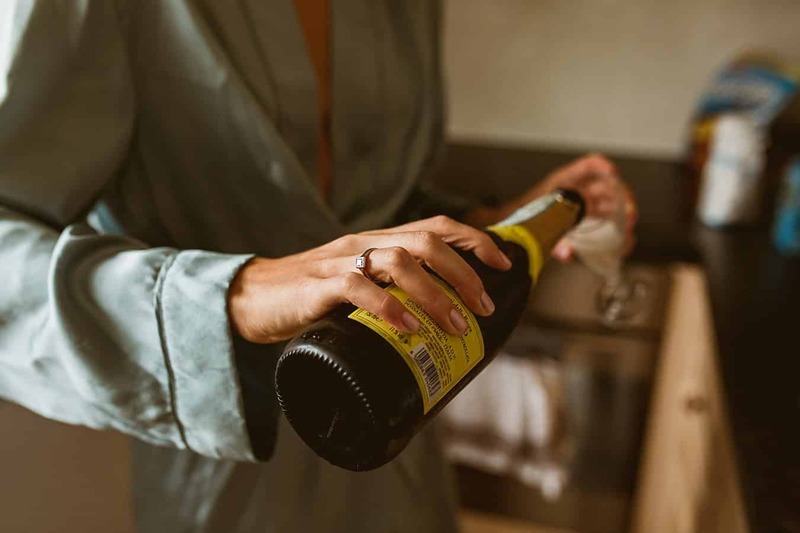 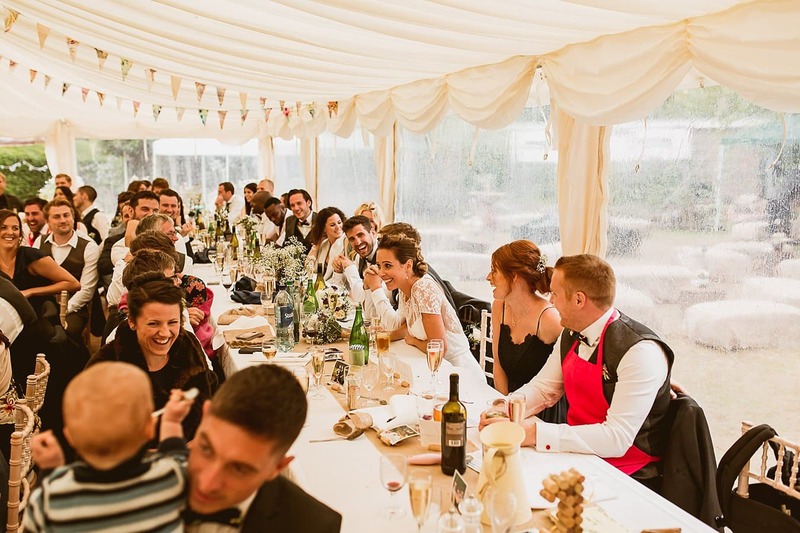 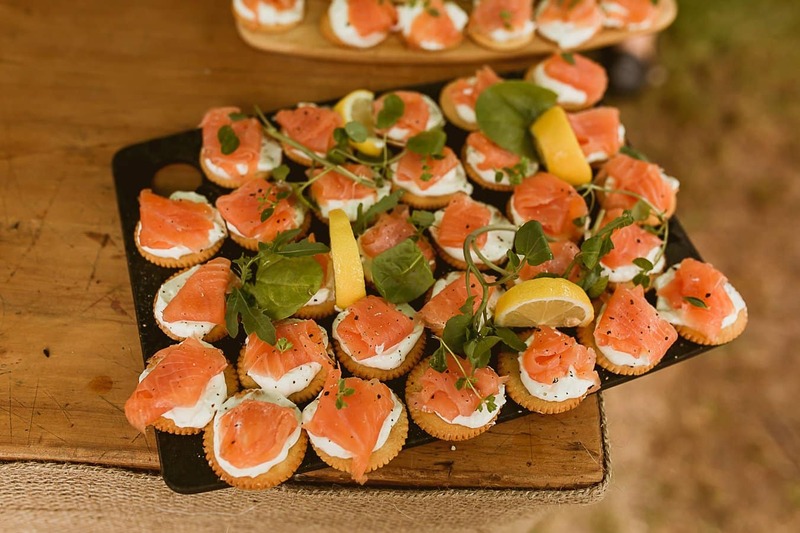 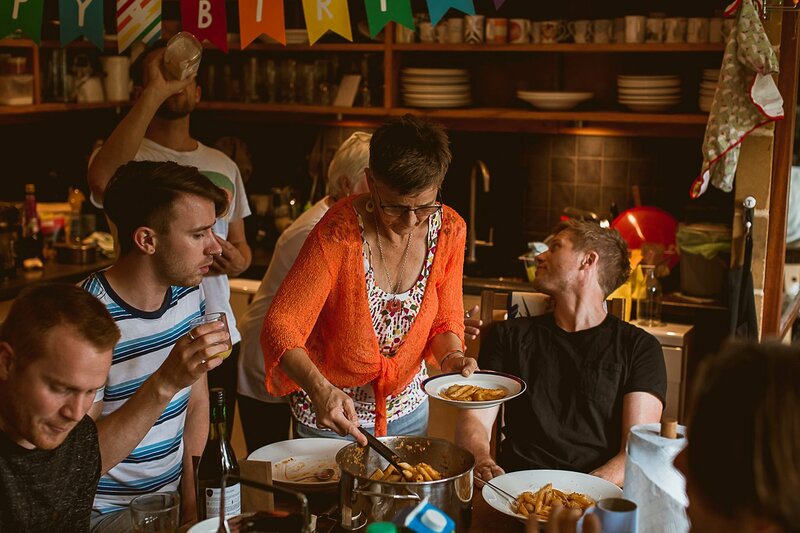 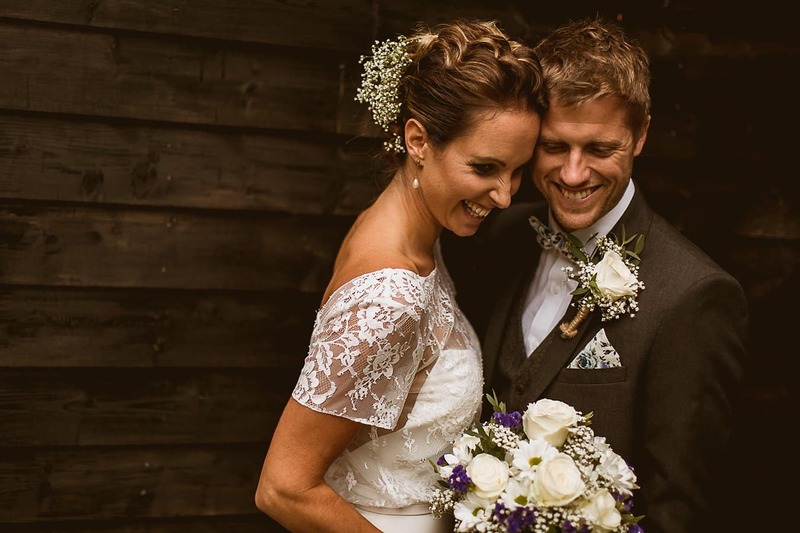 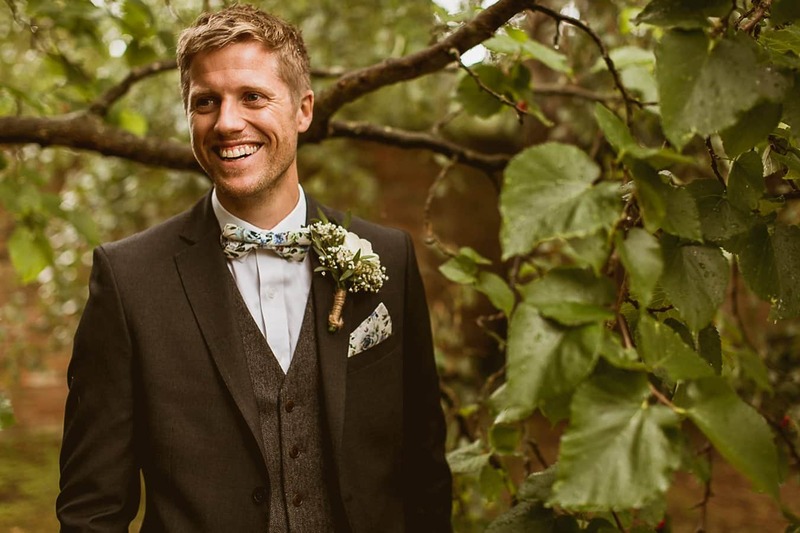 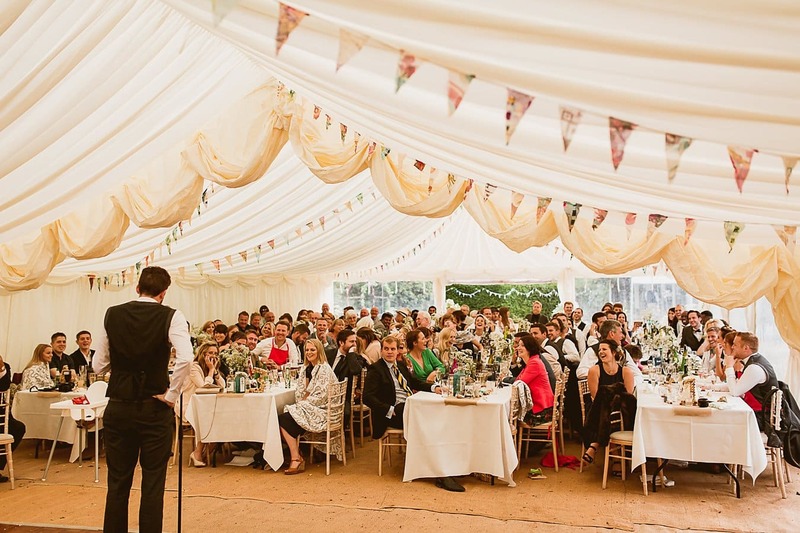 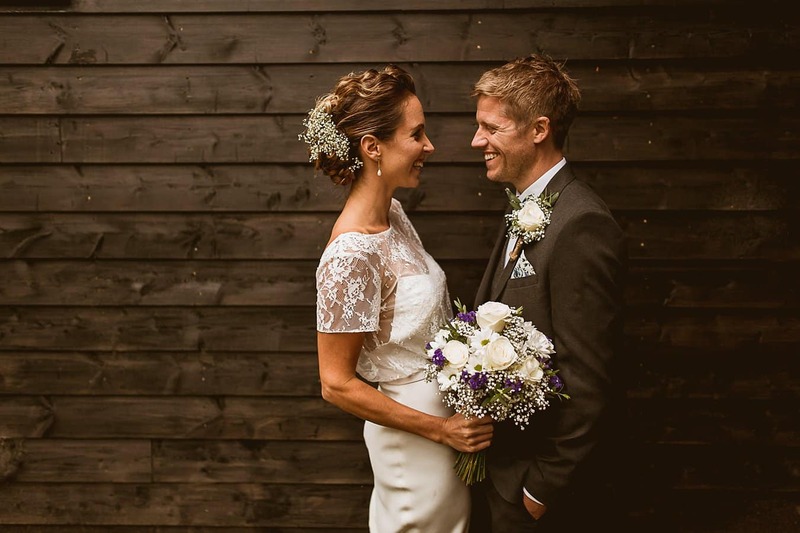 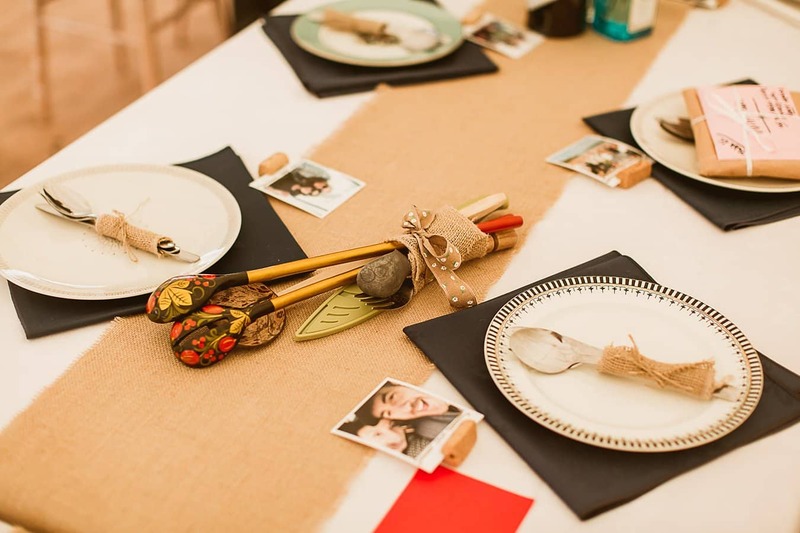 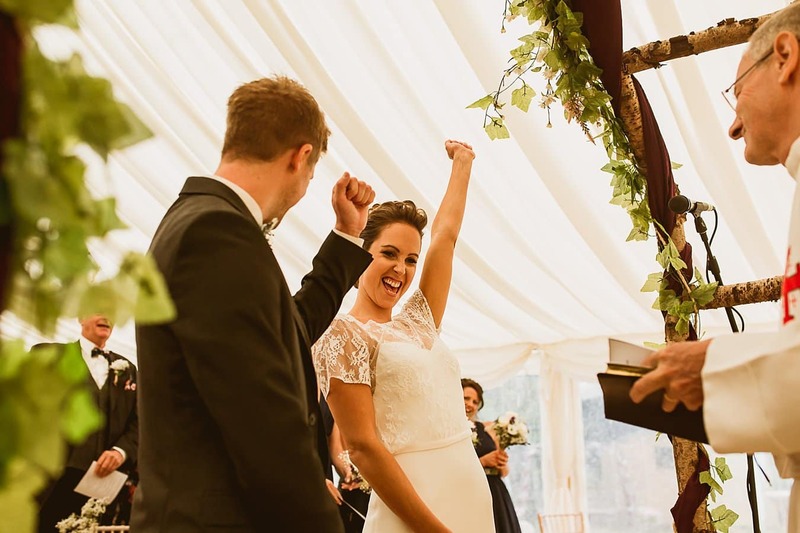 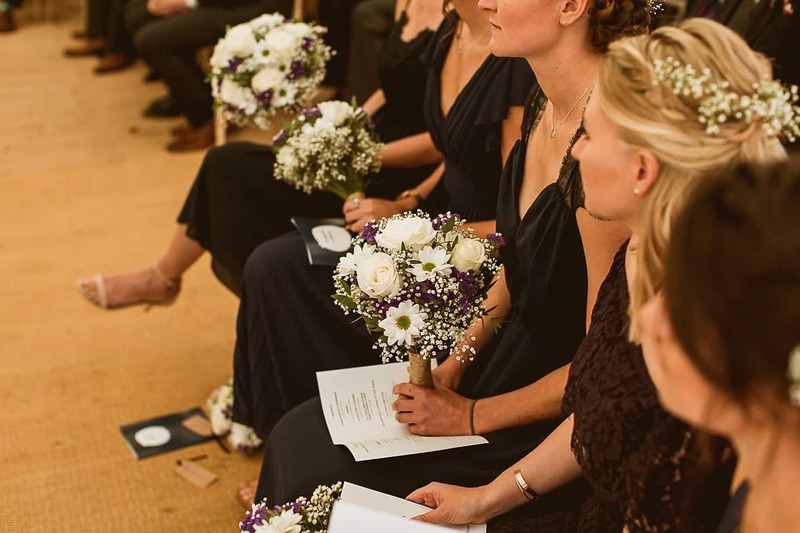 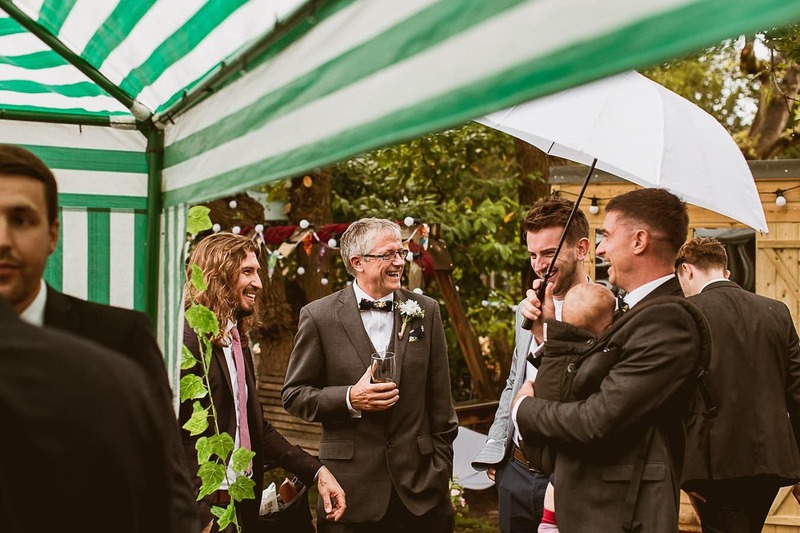 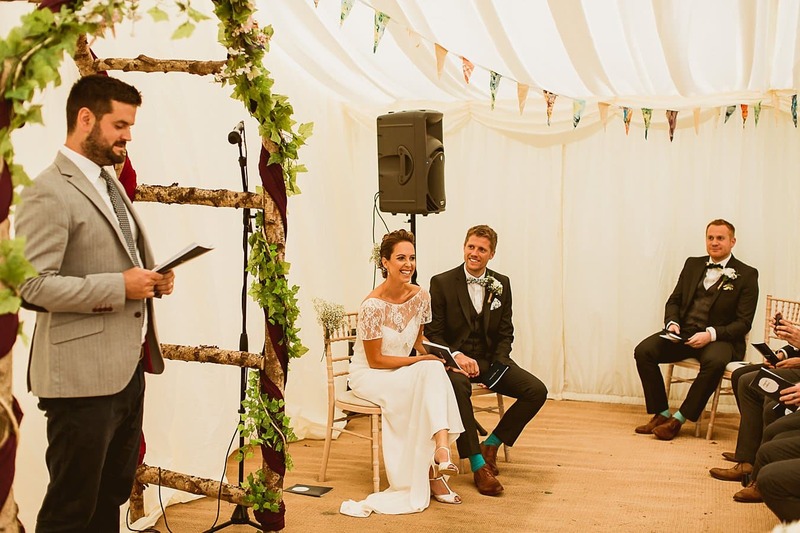 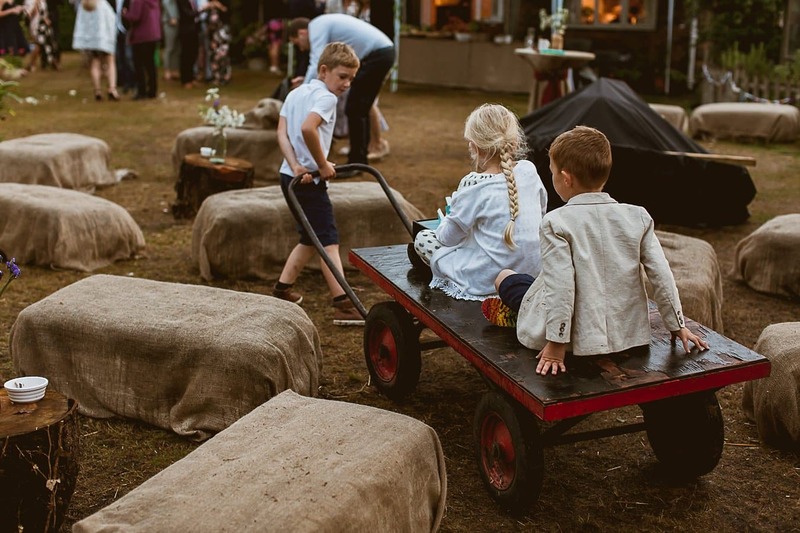 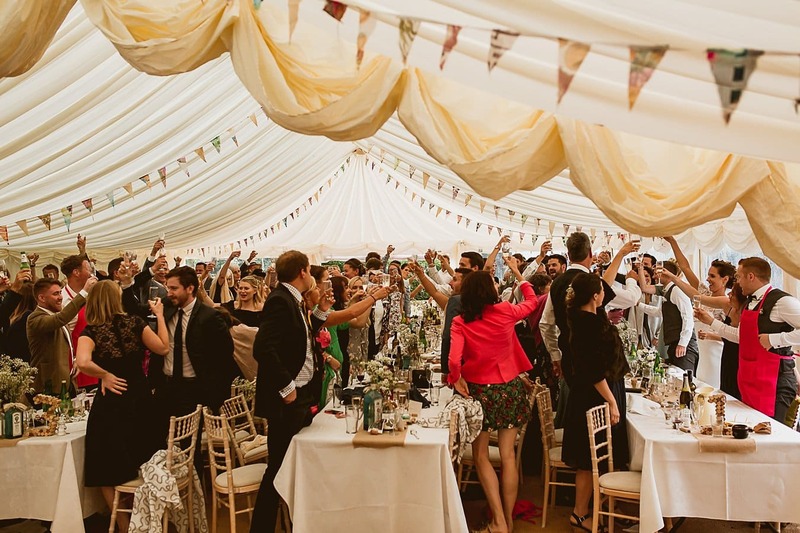 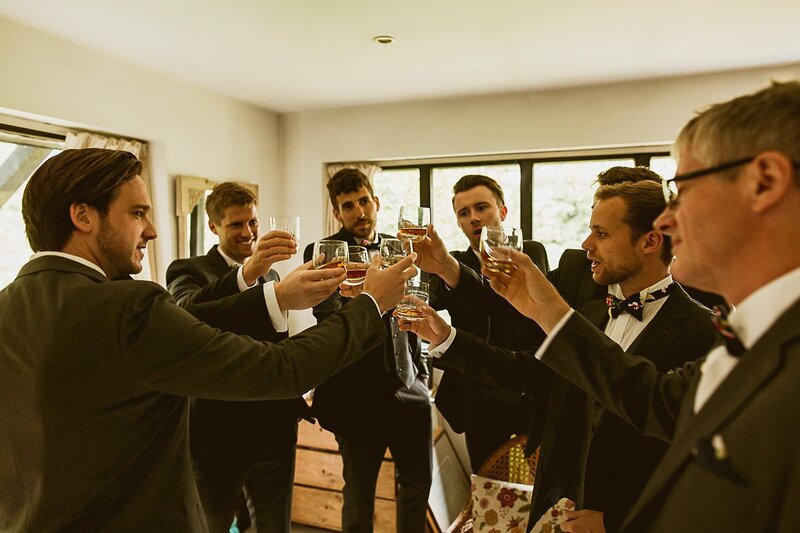 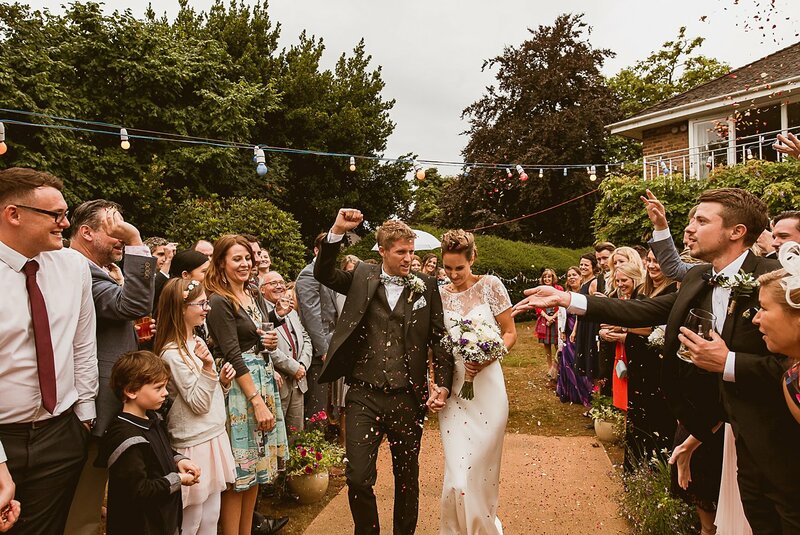 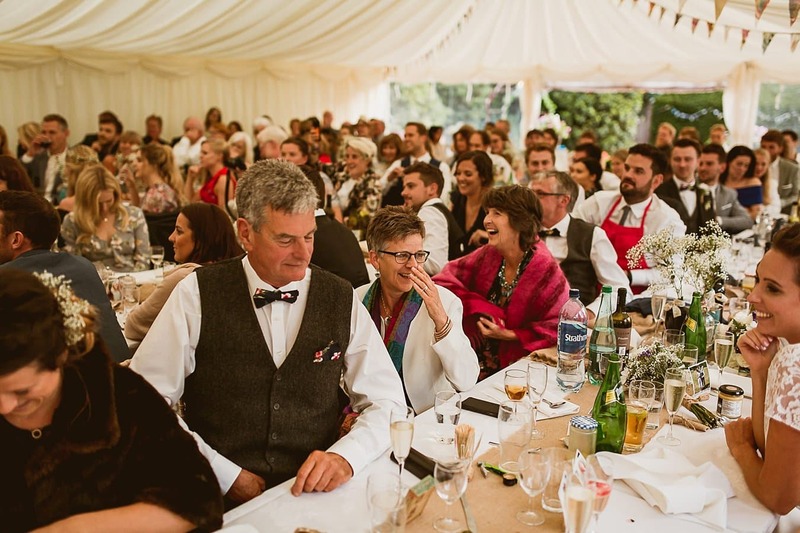 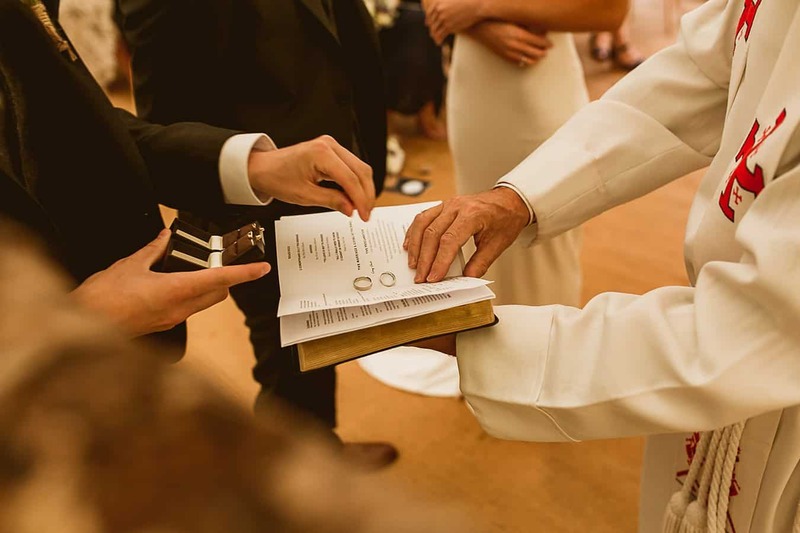 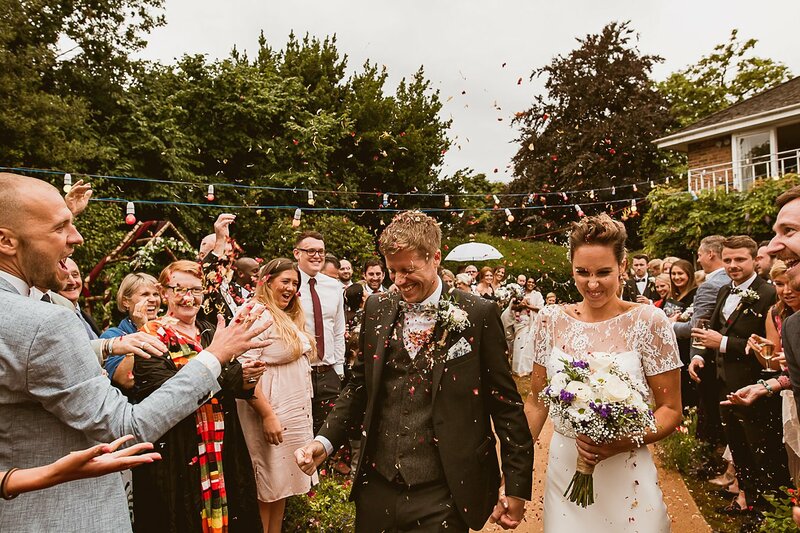 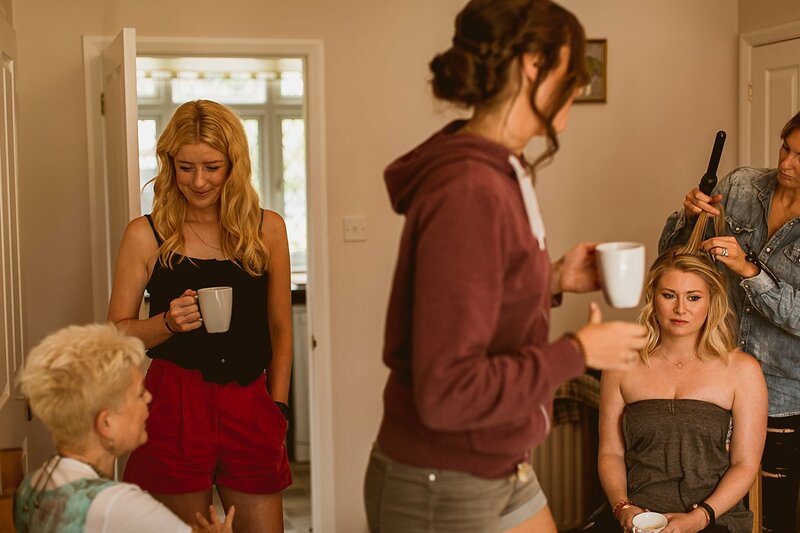 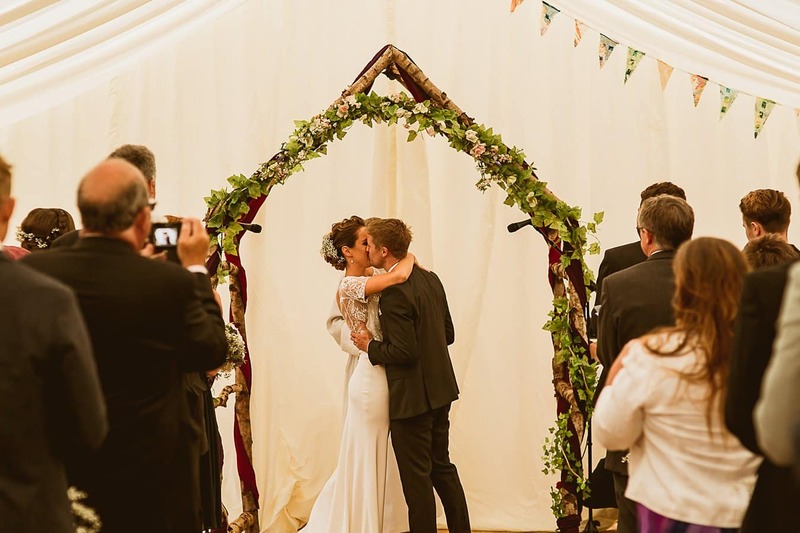 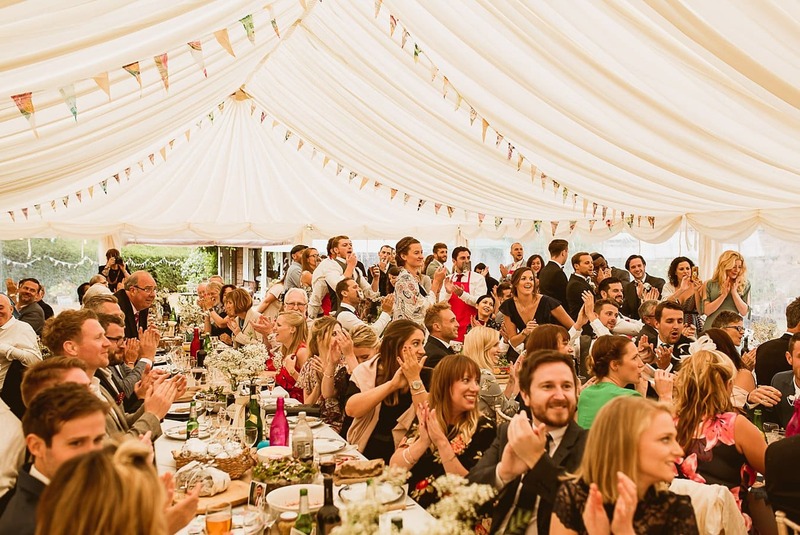 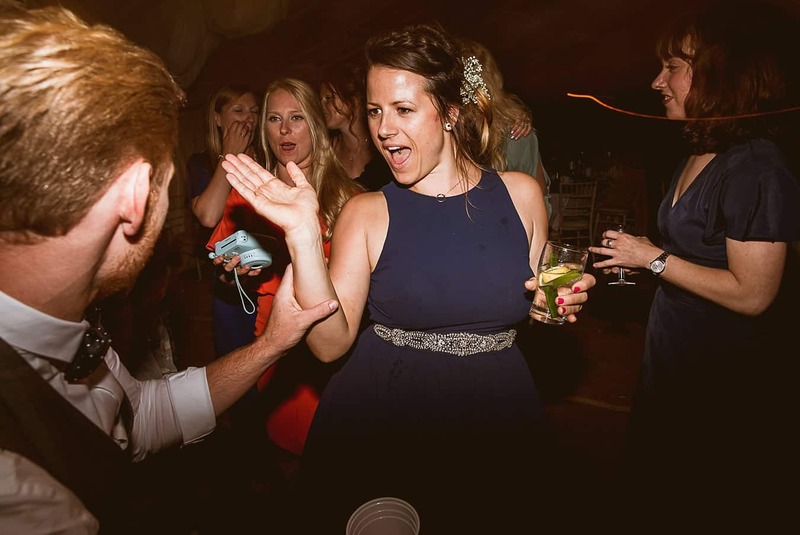 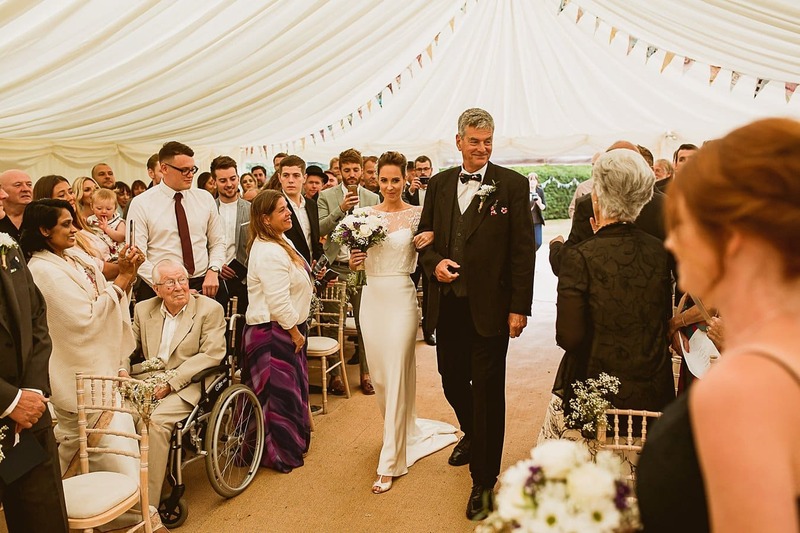 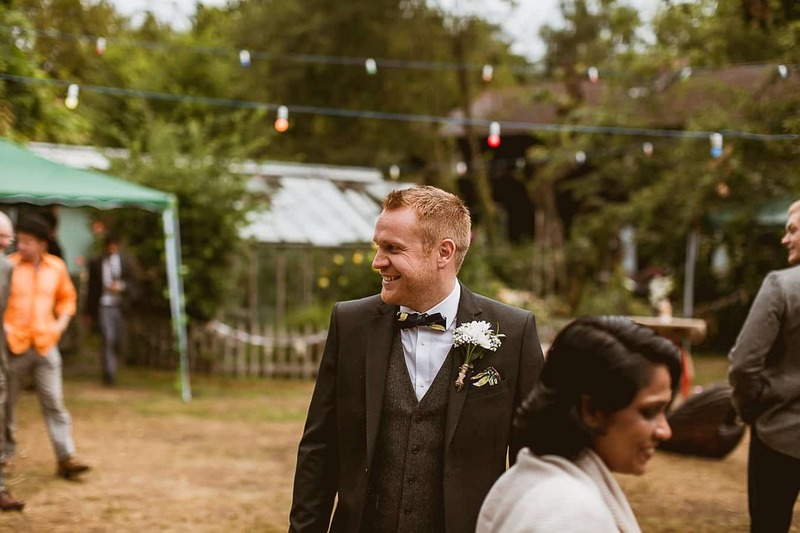 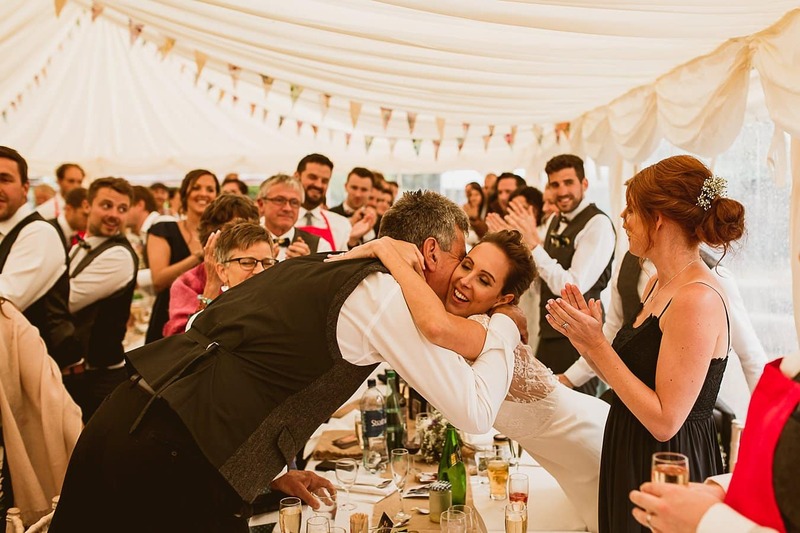 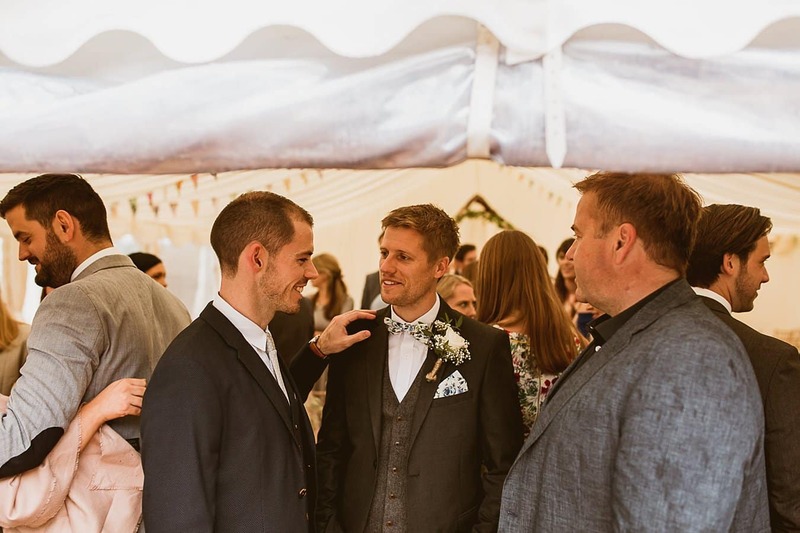 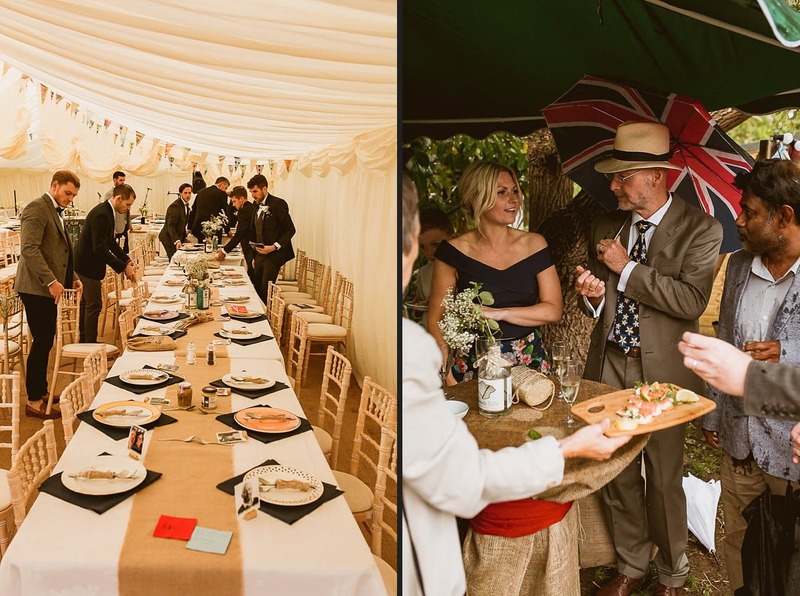 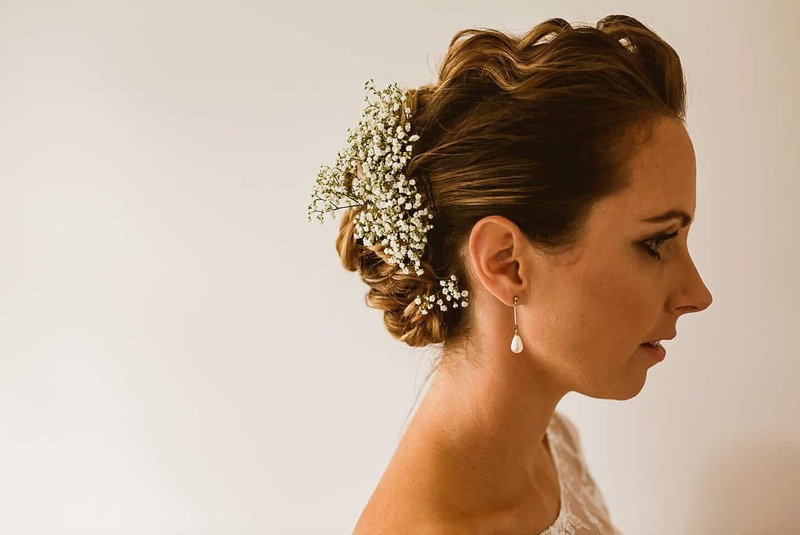 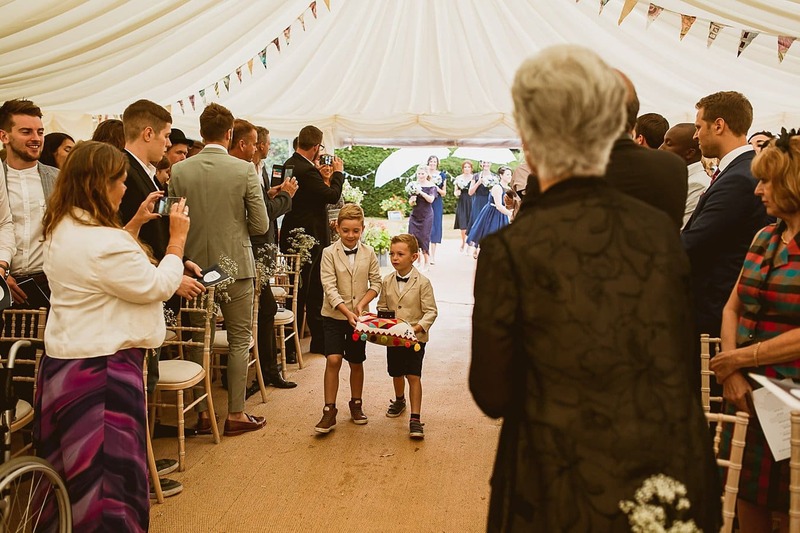 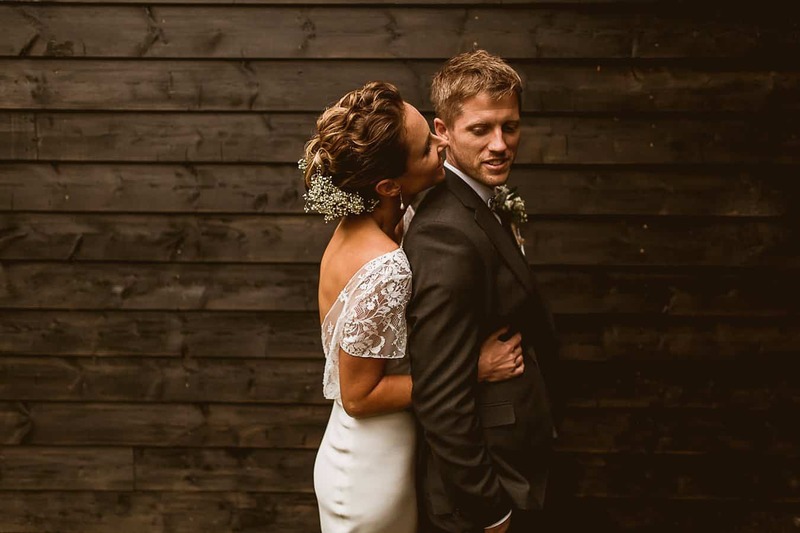 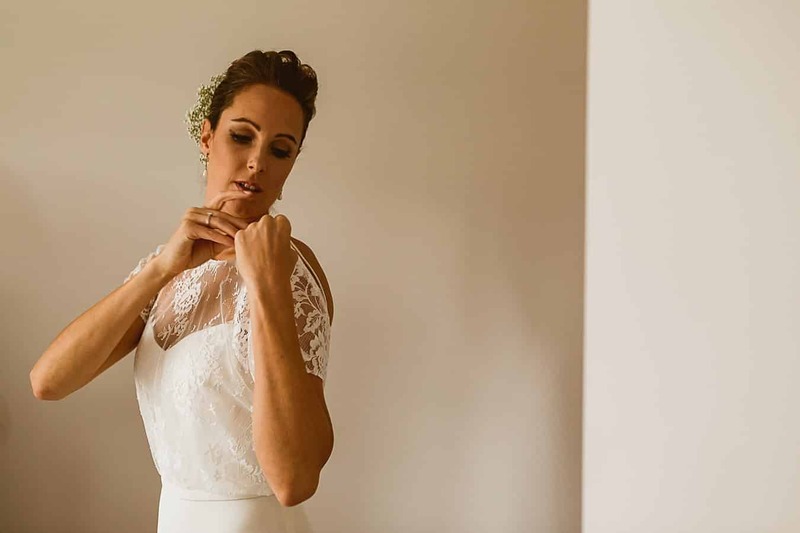 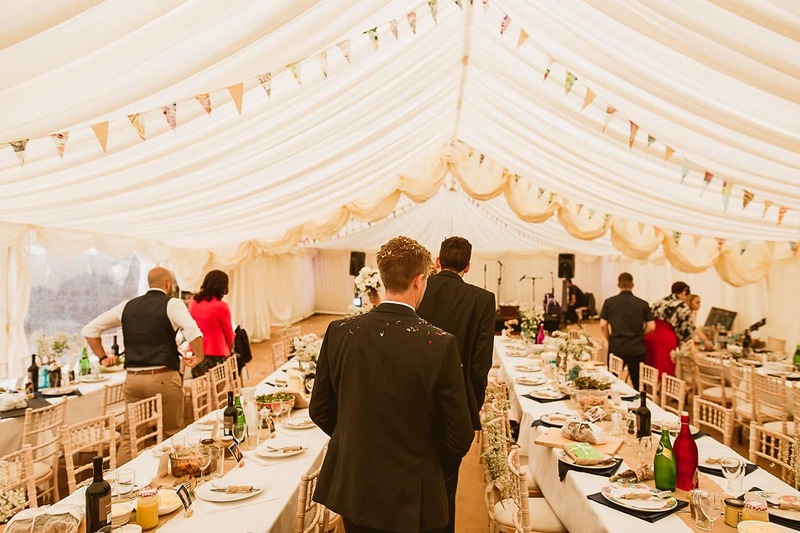 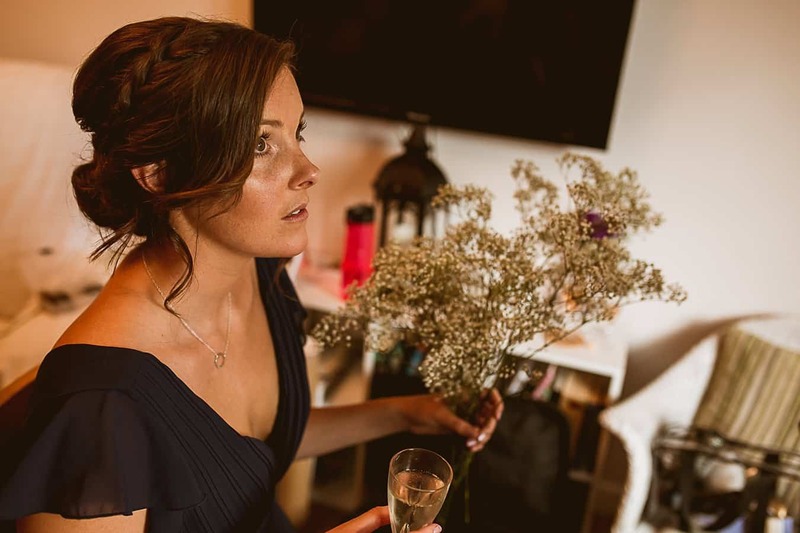 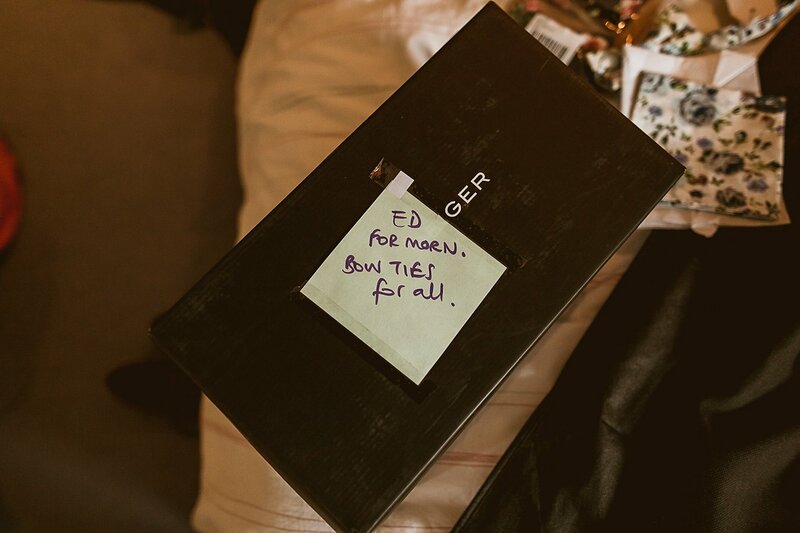 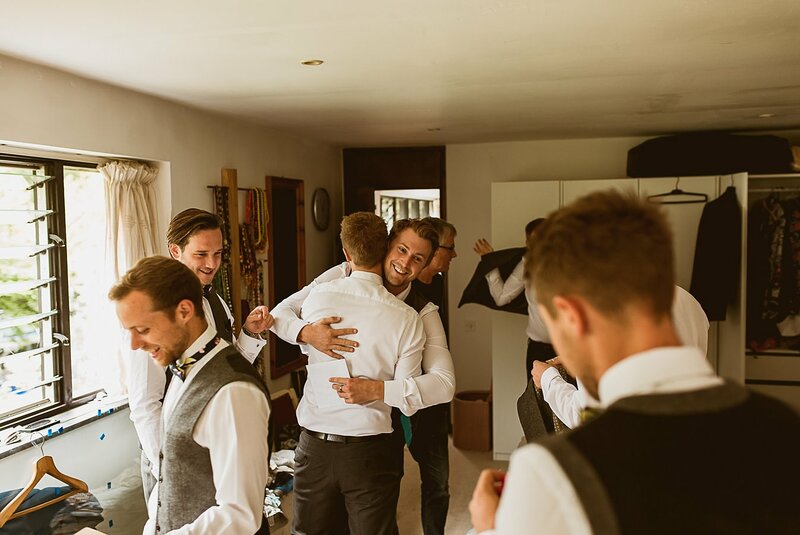 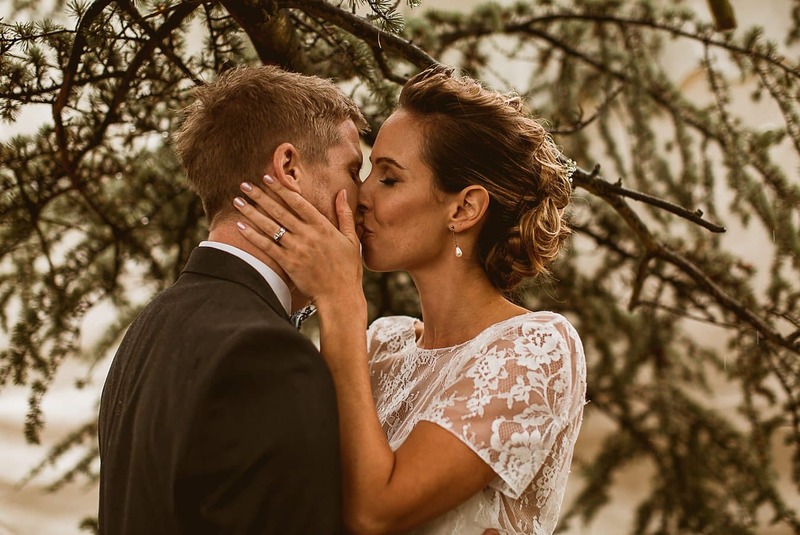 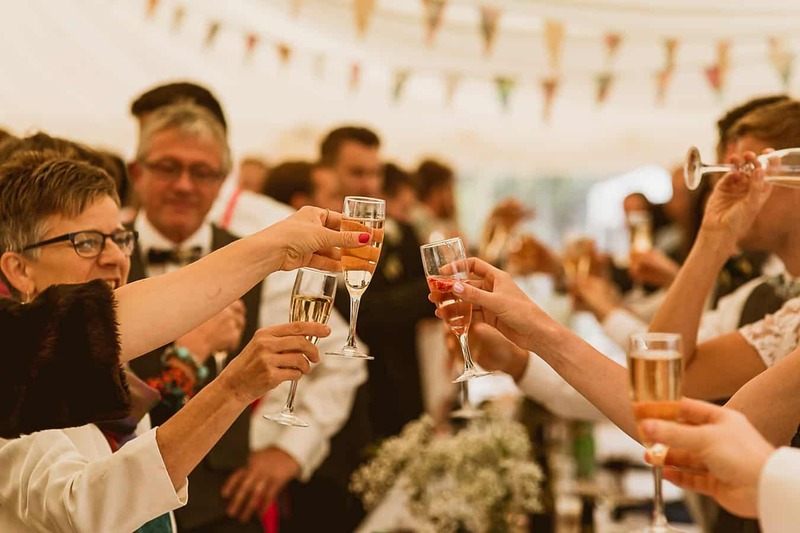 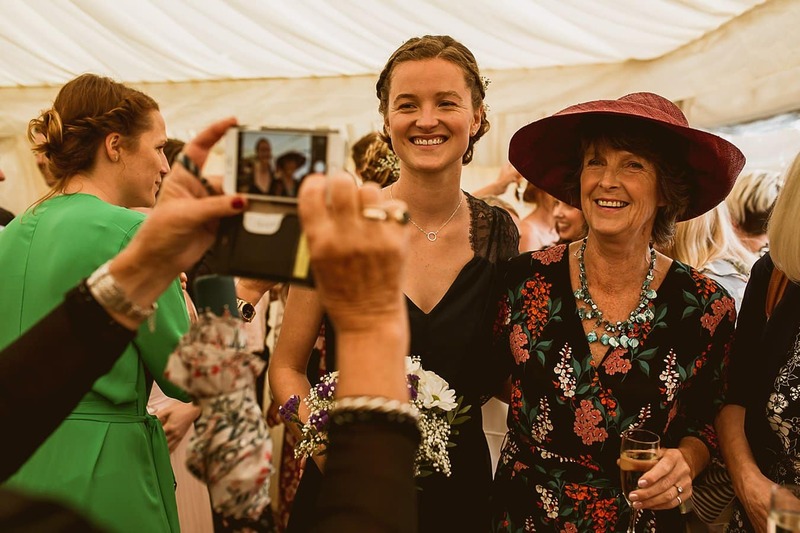 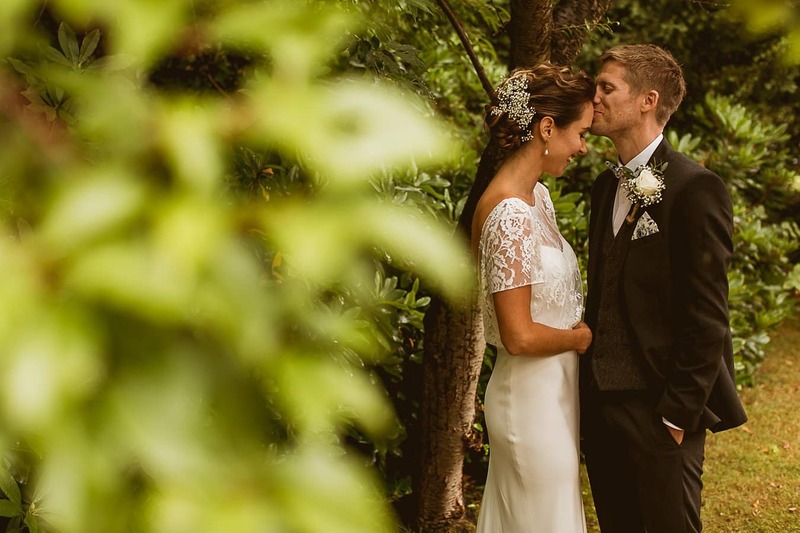 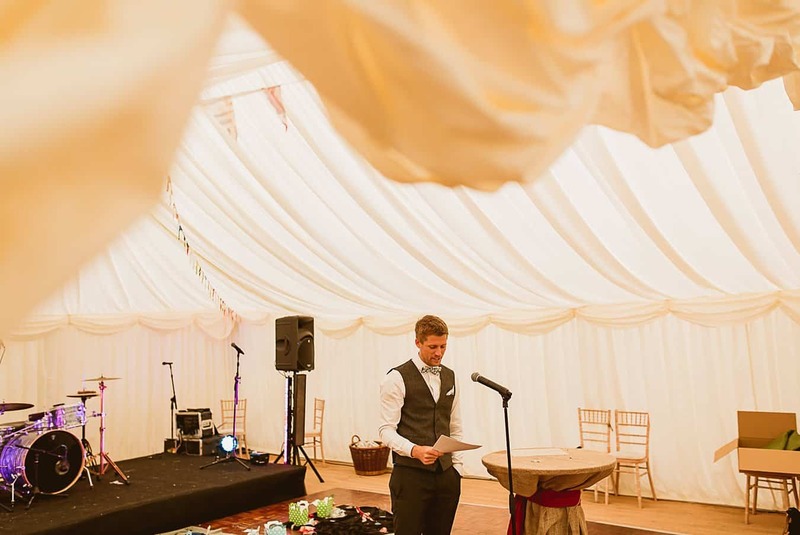 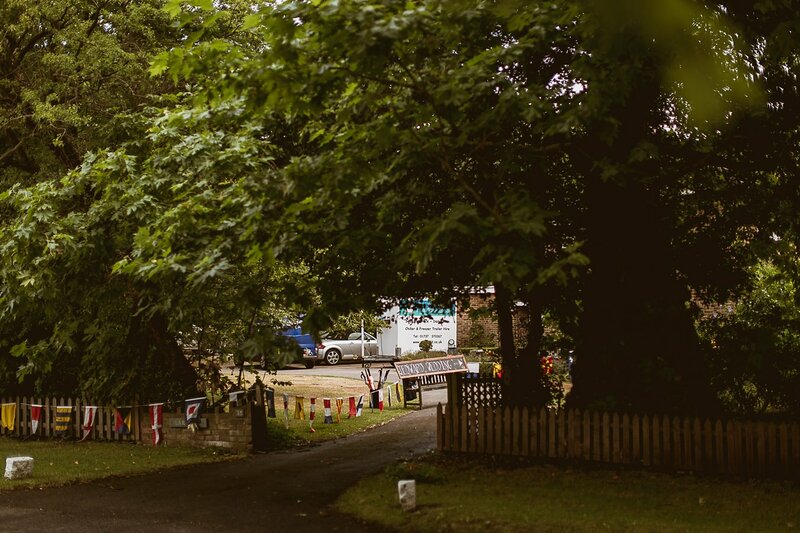 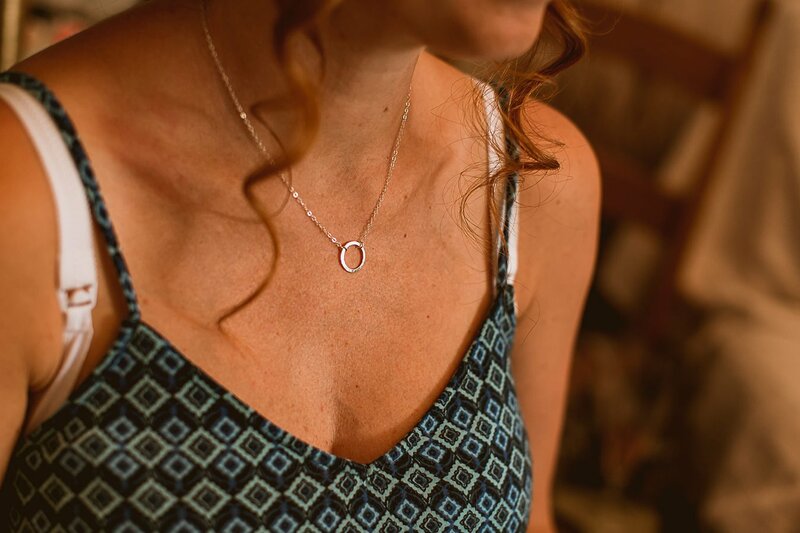 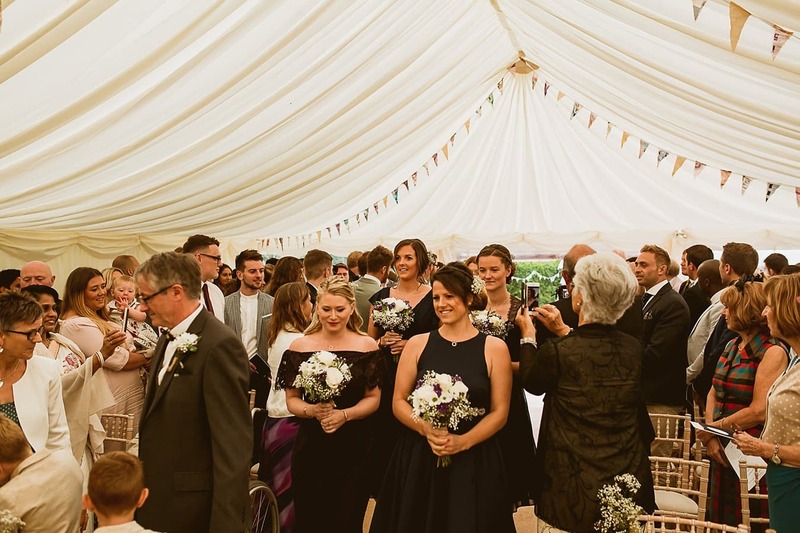 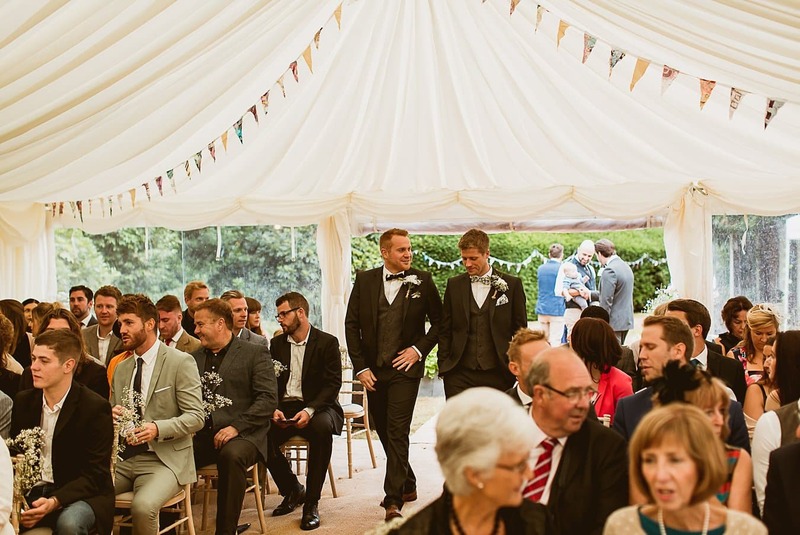 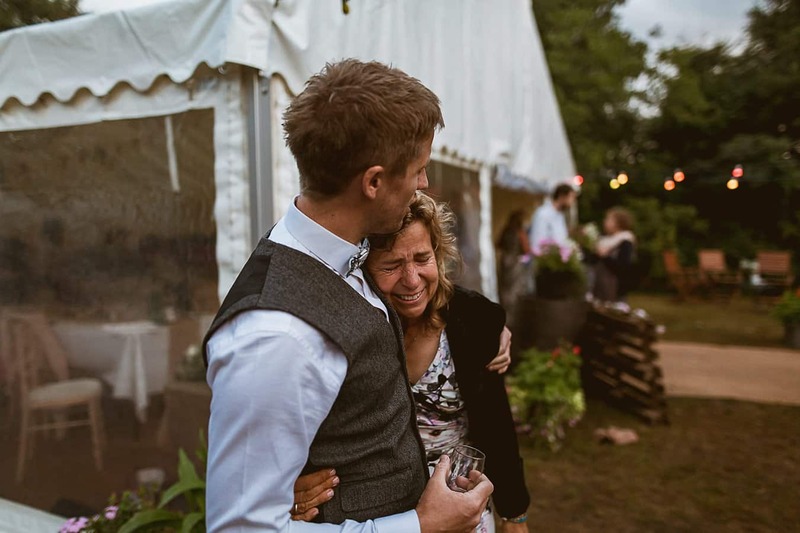 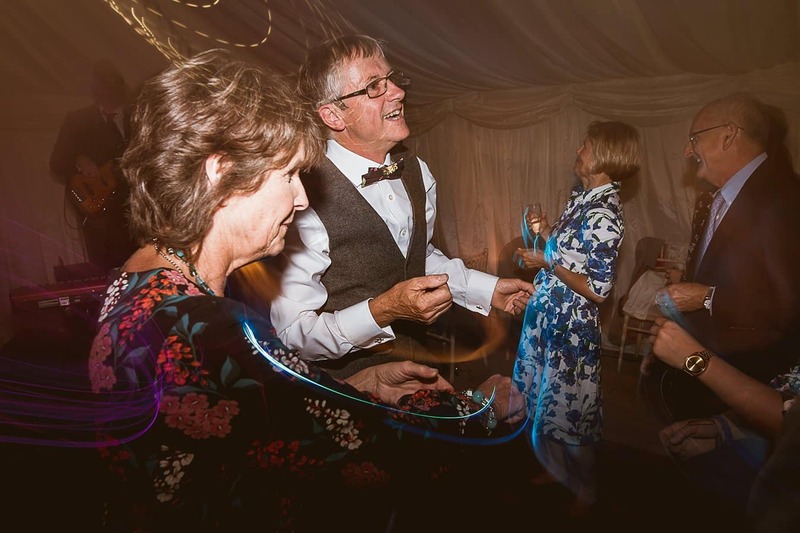 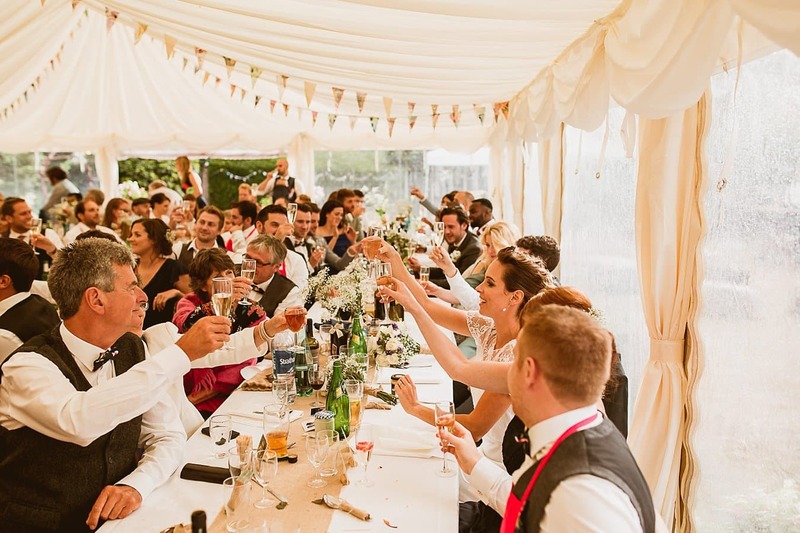 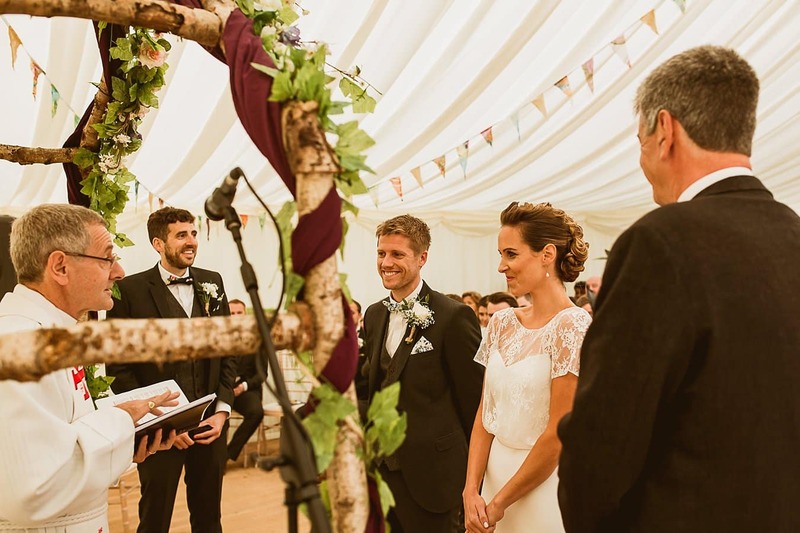 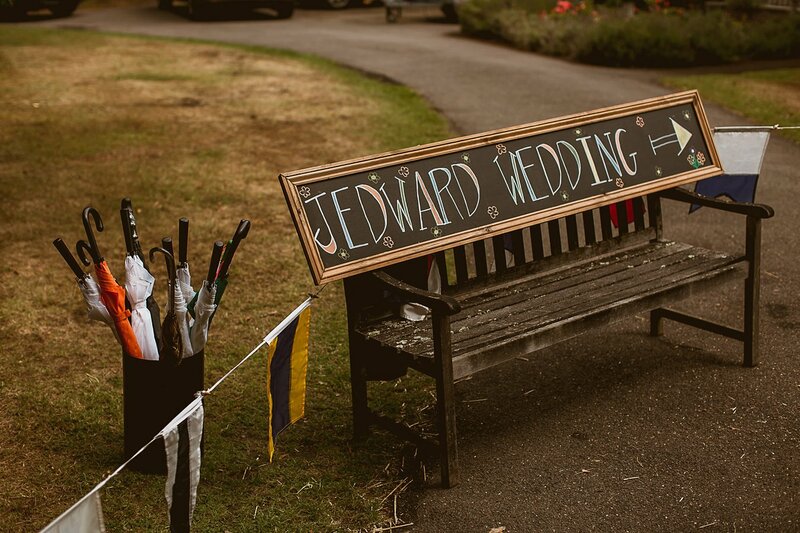 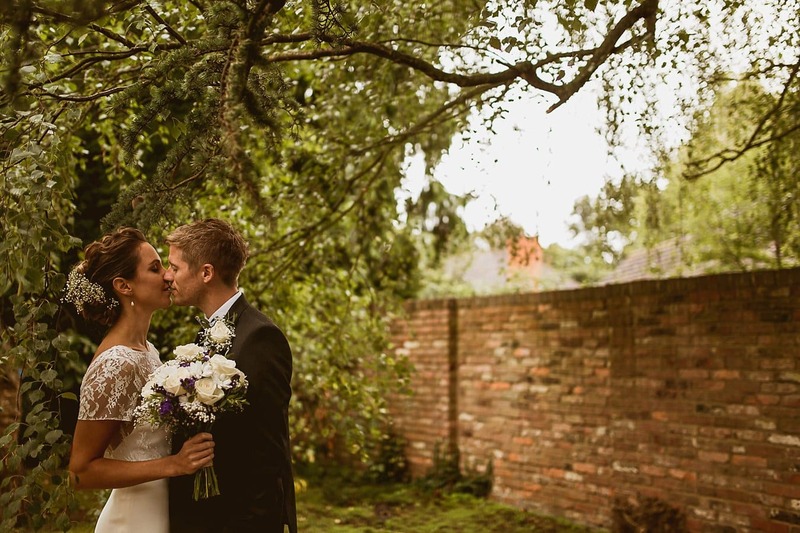 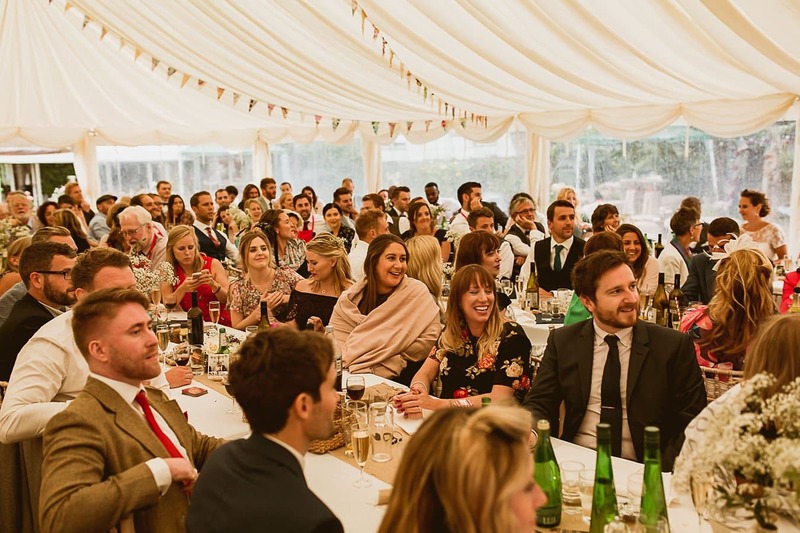 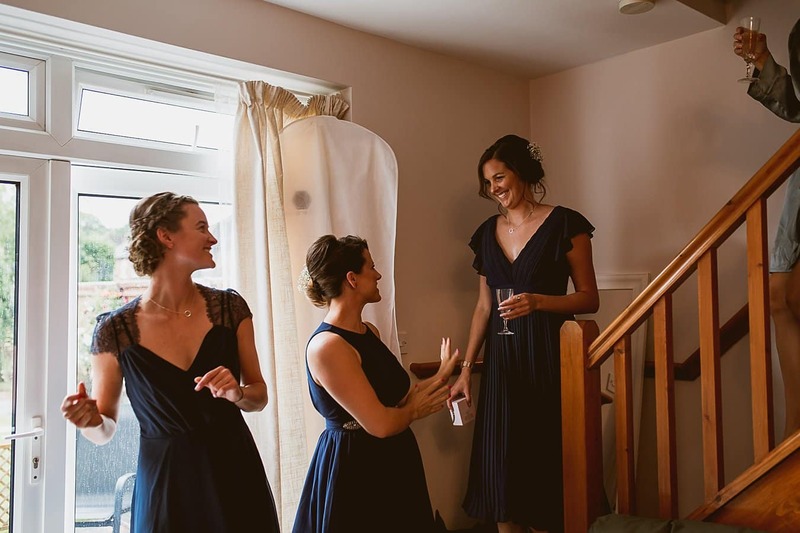 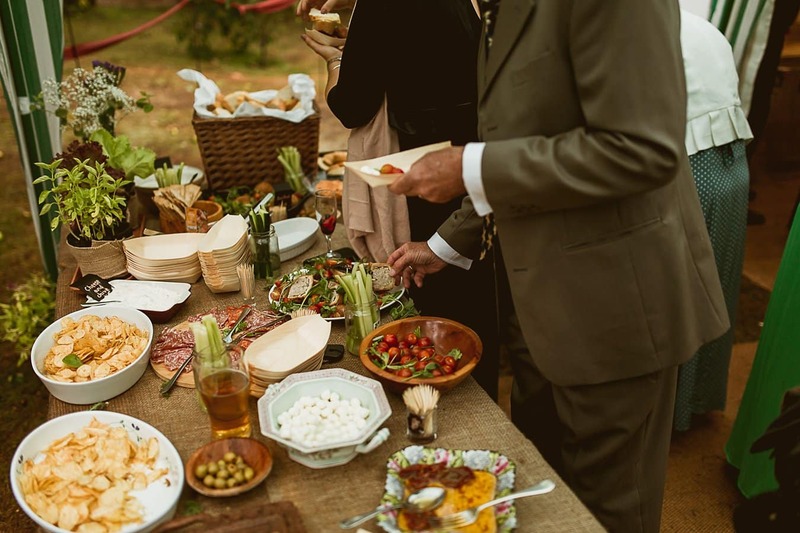 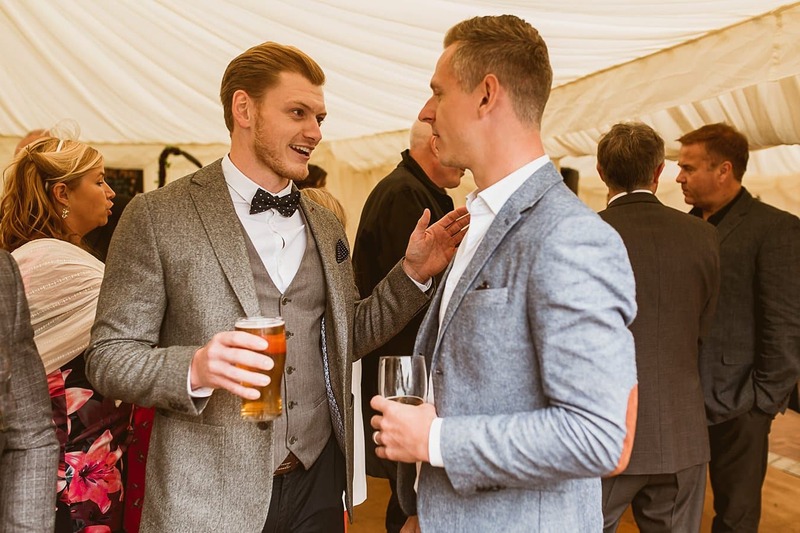 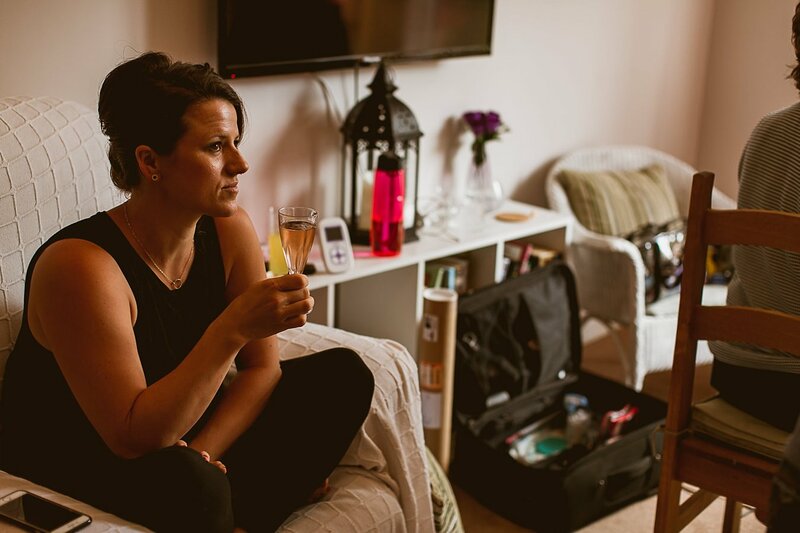 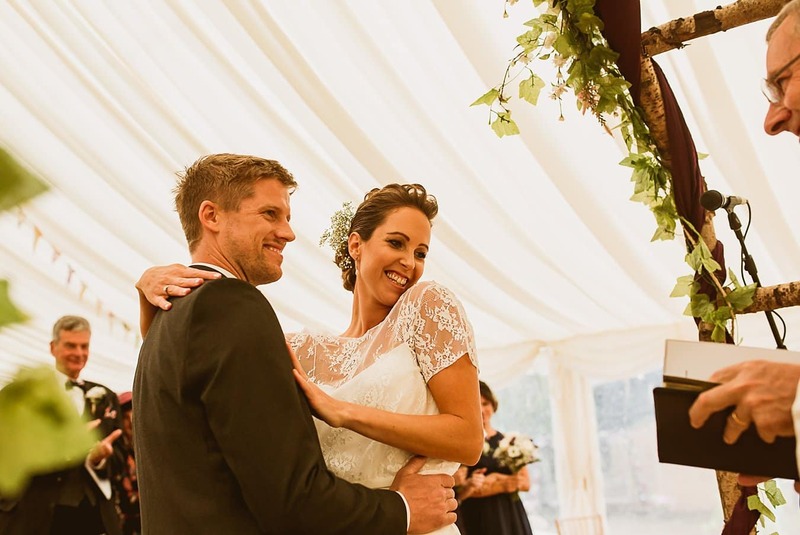 Generous and gregarious by nature, it was no surprise that keeping people properly fed and watered was at the top of Jenny + Ed’s priority list for their garden wedding. 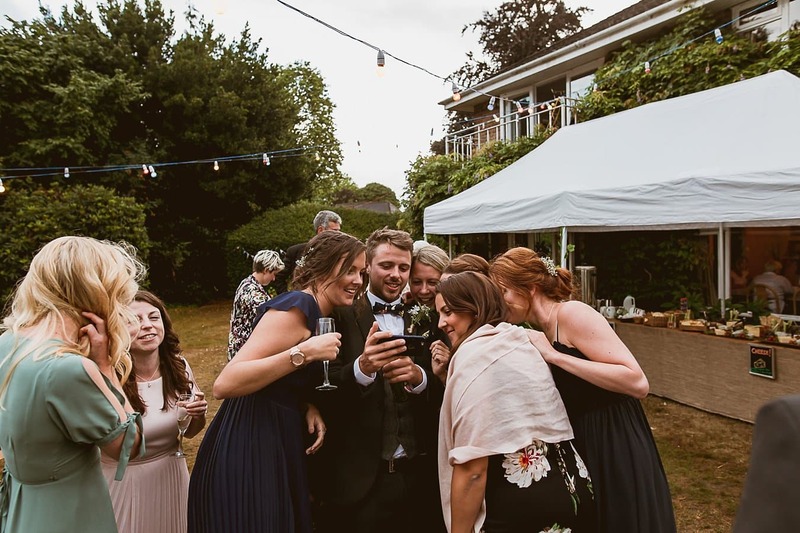 Their well-stocked free bar, ‘Prosecco Pimping’ station and canapé table kept everyone ticking over until the Wedding Breakfast was served. 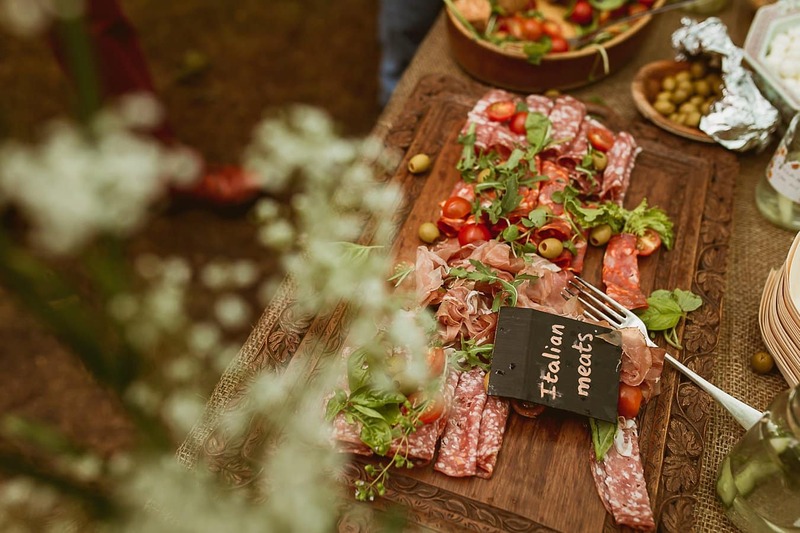 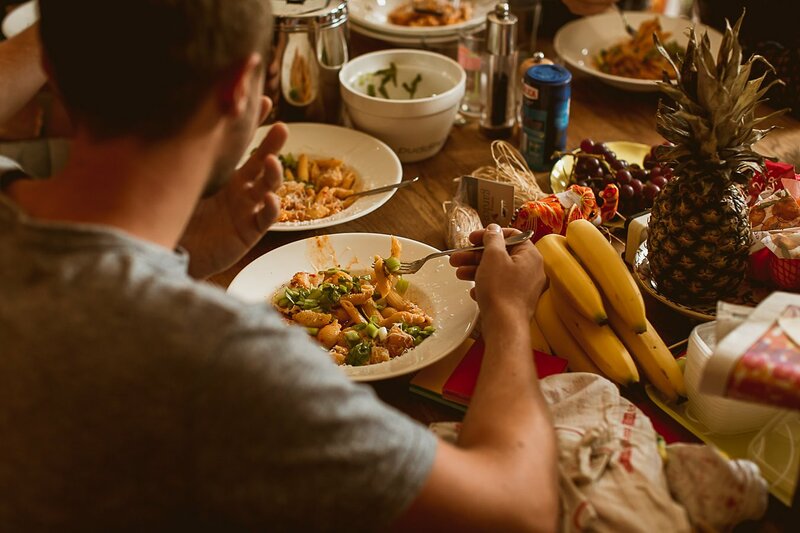 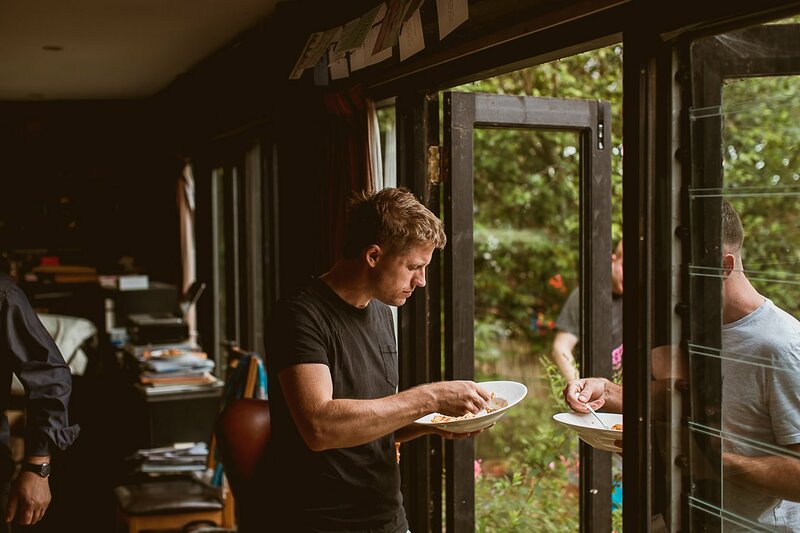 Keeping things playful, Jenny + Ed opted for a sharing meal of cooked ham, salad and accompaniments which was served to the Guests by a ‘chef’ nominated from each table. 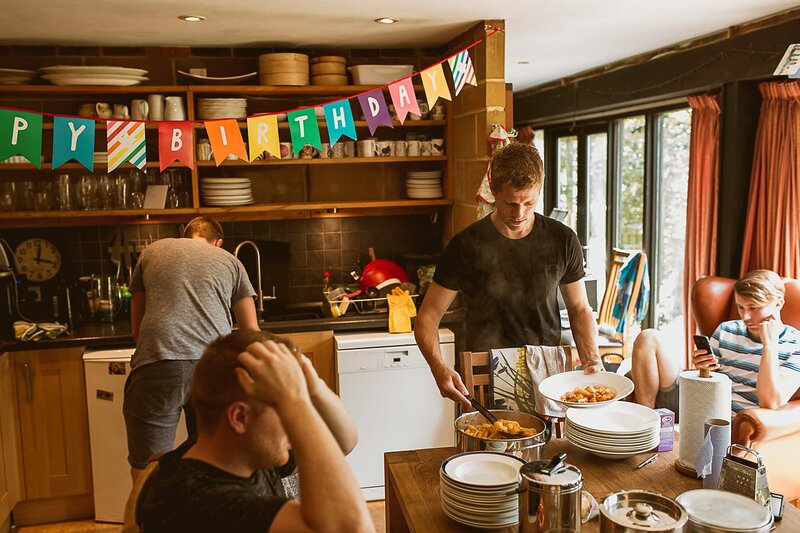 Just to ensure no-one went hungry, they even laid on an epic cheese table after the meal. 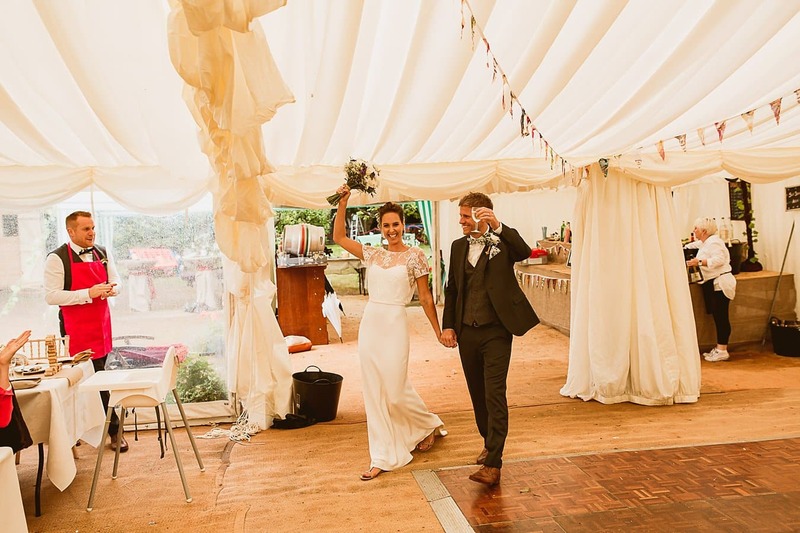 The decor was kept stylish and simple, with an eclectic mix of Gin bottles holding pretty bunches of Baby’s Breath, mismatched crockery, handmade bunting and lots of hessian, all complementing Jenny’s simple and beautiful wedding gown, which she designed herself and had made by her clever Seamstress friend back home in Hong Kong, Christine Ritter. 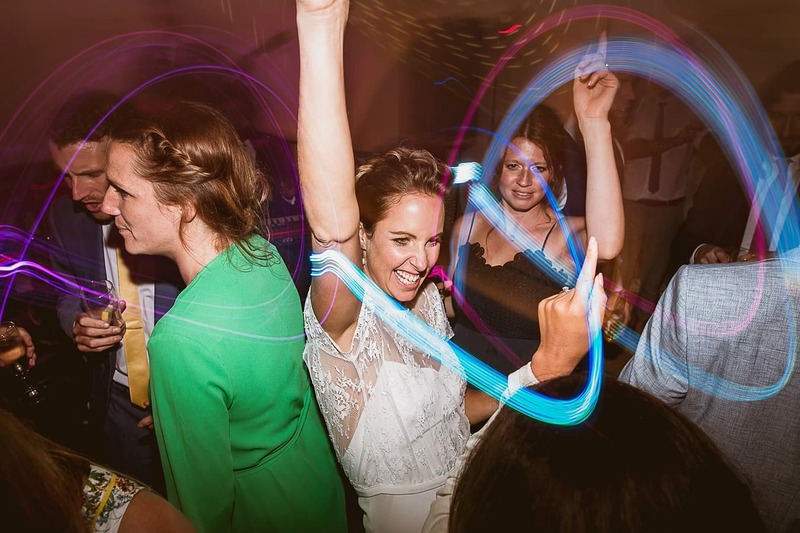 After the Speeches, cocktails and a lively band with dancing paved the way for a relaxed, fun and informal night. 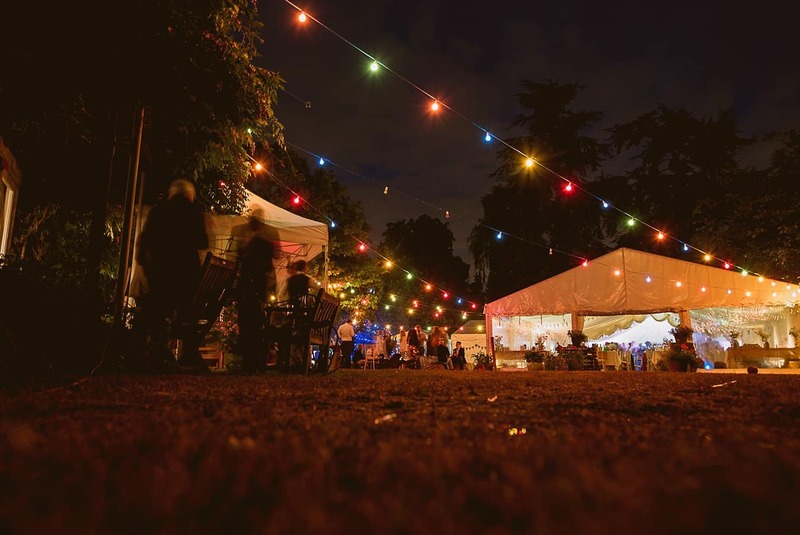 Finally, the rain held off long enough for everyone to get outside and enjoy the garden, now softly lit with the glow of dozens of fairy lights and bulbs strung overhead. 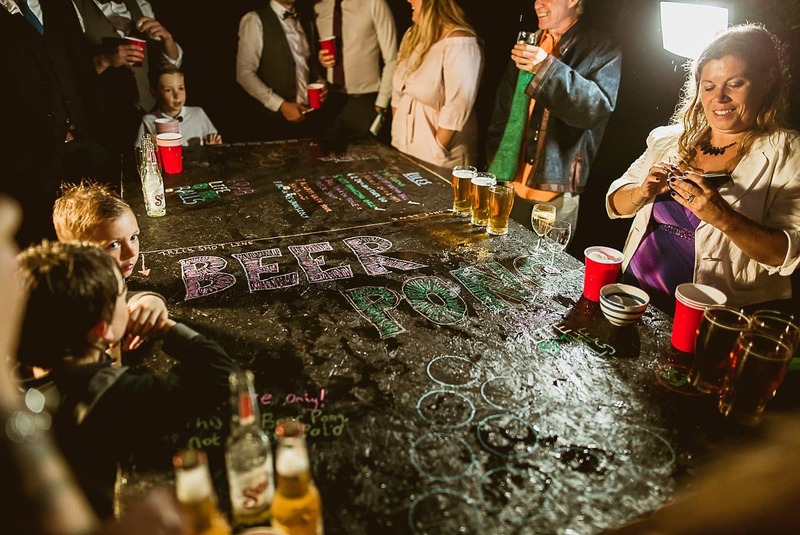 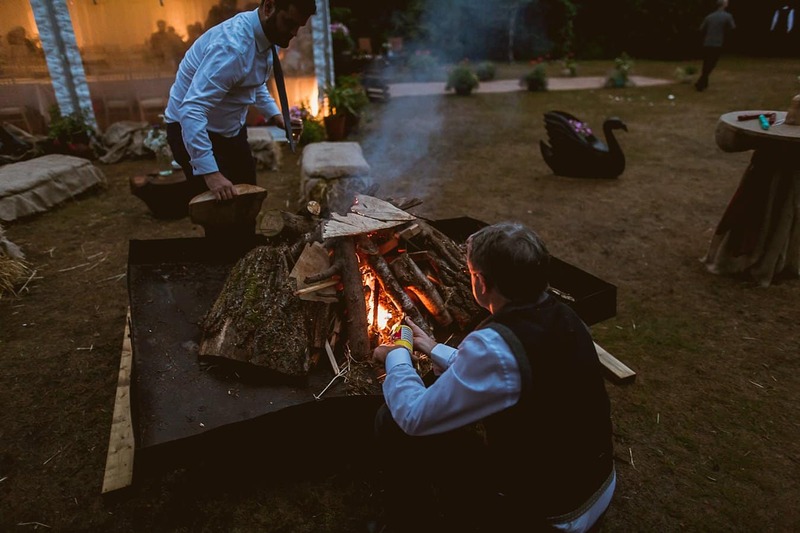 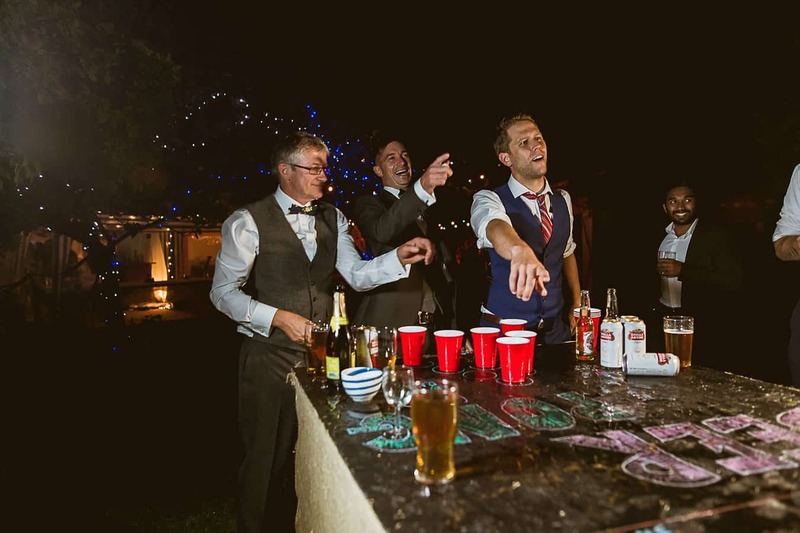 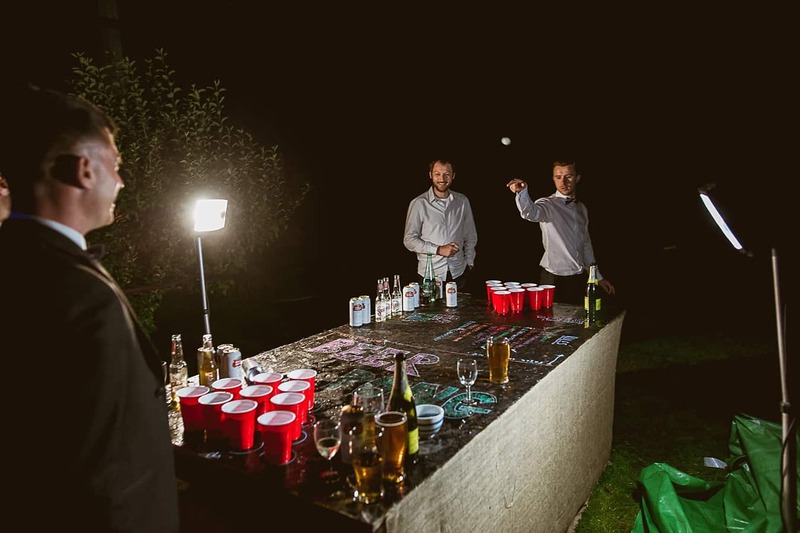 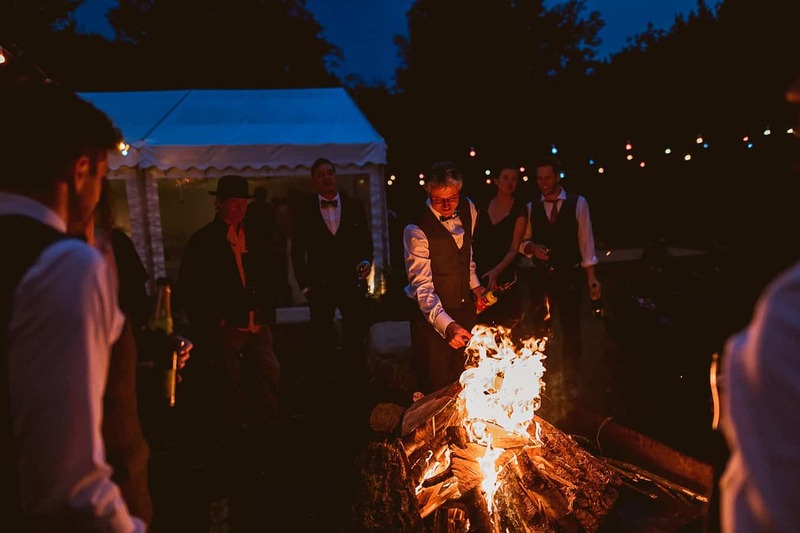 As the sun dropped out of the rain-soaked sky, the guests warmed themselves by a roaring bonfire, and the drinking (and Beer Pong!!) 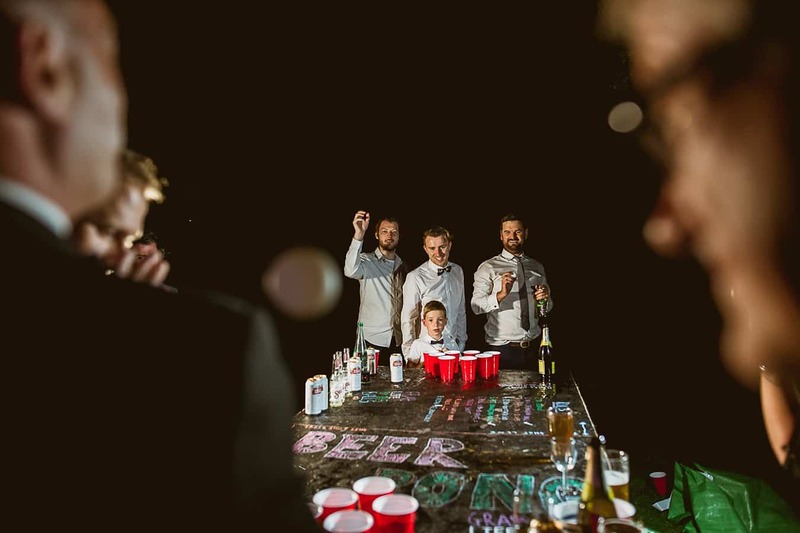 continued long into the night.